Boardgames FM is now Boardgames Daily! Tune in daily for great conversations on boardgames, tabletop gaming and so much more with Boardgames Daily powered by Theology of Games! 276 - Welcome to... the show! We've got a new contest going on! Win copy of Call to Adventure from Brotherwise Games! Just tweet, and tag @BoardgamesDaily and @TheologyofGames using the hashtag #CalltoAdventure and tell us your character name and Origins story in 280 characters or less!! And we'll pick a winner on May 6! Scott brings us this week's Game Night Cage Fight: It's Trajan vs. Crusaders! The battle of the Mancalas! And AJ discusses the news of the latest updates from AEG's Kickstarters AJ also has a first impression of Welcome To... from Deep Water Games! Check out our brand new Spreadshop at shop.spreadshirt.com/theology-of-games you can find all sorts of sweet gear! You can now be on the show! Call tel:216-352-3864 and leave us a message! Don’t forget to head to TheologyofGames.com/Patreon to find out all of the sweet rewards we have for our patrons and how you can become a part of what we do — if you like what you hear it would be awesome if you’d share this show with a friend, or subscribe, rate and review us in iTunes and Google Play! Or better yet use that nifty applause feature in the Anchor app! You can find more about Boardgames Daily, and Theology of Games at http://Theologyofgames.com! We've got a new contest going on! Win copy of Call to Adventure from Brotherwise Games! Just tweet, and tag @BoardgamesDaily and @TheologyofGames using the hashtag #CalltoAdventure and tell us your character name and Origins story in 280 characters or less!! And we'll pick a winner on May 6! Scott brings us Kickstarter Weekly/1 Brought to you by Stimulus Games check out Movie Empire until April 25! And AJ discusses the news of the latest from North Star Games, Evolution "Oceans"! Check out our brand new Spreadshop at shop.spreadshirt.com/theology-of-games you can find all sorts of sweet gear! You can now be on the show! Call tel:216-352-3864 and leave us a message! Don’t forget to head to TheologyofGames.com/Patreon to find out all of the sweet rewards we have for our patrons and how you can become a part of what we do — if you like what you hear it would be awesome if you’d share this show with a friend, or subscribe, rate and review us in iTunes and Google Play! Or better yet use that nifty applause feature in the Anchor app! You can find more about Boardgames Daily, and Theology of Games at http://Theologyofgames.com! We've got a new contest going on! Win copy of Call to Adventure from Brotherwise Games! Just tweet, and tag @BoardgamesDaily and @TheologyofGames using the hashtag #CalltoAdventure and tell us your character name and Origins story in 280 characters or less!! And we'll pick a winner on May 6! Today we kick off another Game Night Cage Fight it's Guildhall from AEG vs. Ethnos from CMON Also Scott brings us some news about some very cool RPG resources! Check out our brand new Spreadshop at shop.spreadshirt.com/theology-of-games you can find all sorts of sweet gear! You can now be on the show! Call tel:216-352-3864 and leave us a message! Don’t forget to head to TheologyofGames.com/Patreon to find out all of the sweet rewards we have for our patrons and how you can become a part of what we do — if you like what you hear it would be awesome if you’d share this show with a friend, or subscribe, rate and review us in iTunes and Google Play! Or better yet use that nifty applause feature in the Anchor app! You can find more about Boardgames Daily, and Theology of Games at http://Theologyofgames.com! 273 - Kickstarter Weekly and Our Favorite Ugly Games! We've got a new contest going on! Win copy of Call to Adventure from Brotherwise Games! Just tweet, and tag @BoardgamesDaily and @TheologyofGames using the hashtag #CalltoAdventure and tell us your character name and Origins story in 280 characters or less!! And we'll pick a winner on May 6! Lots going on today! First! Kickstarter Weekly! Brought to you by Stimulus Games check out Movie Empire until April 25! Also check out Valley of the Kings Premium edition from AEG. And AJ gives his thoughts on Sailing Towards Osiris. And we start a new topic! What's your favorite ugly game!!?? Check out our brand new Spreadshop at shop.spreadshirt.com/theology-of-games you can find all sorts of sweet gear! You can now be on the show! Call tel:216-352-3864 and leave us a message! Don’t forget to head to TheologyofGames.com/Patreon to find out all of the sweet rewards we have for our patrons and how you can become a part of what we do — if you like what you hear it would be awesome if you’d share this show with a friend, or subscribe, rate and review us in iTunes and Google Play! Or better yet use that nifty applause feature in the Anchor app! You can find more about Boardgames Daily, and Theology of Games at http://Theologyofgames.com! 272 - Diablo... the Board Game?? We've got a new contest going on! Win copy of Call to Adventure from Brotherwise Games! Just tweet, and tag @BoardgamesDaily and @TheologyofGames using the hashtag #CalltoAdventure and tell us your character name and Origins story in 280 characters or less!! And we'll pick a winner on May 6! Today AJ and Firestone weigh in on this week's Game Night Cage Fight (between The Resistance and Coup) and Board Game news of Diablo the Board Game! Check out our brand new Spreadshop at shop.spreadshirt.com/theology-of-games you can find all sorts of sweet gear! You can now be on the show! Call tel: 216-352-3864 and leave us a message! Don’t forget to head to TheologyofGames.com/Patreon to find out all of the sweet rewards we have for our patrons and how you can become a part of what we do — if you like what you hear it would be awesome if you’d share this show with a friend, or subscribe, rate and review us in iTunes and Google Play! Or better yet use that nifty applause feature in the Anchor app! You can find more about Boardgames Daily, and Theology of Games at http://Theologyofgames.com! 271 - It's a New Contest! And a Cage Fight!! We've got a new contest going on! Win copy of Call to Adventure from Brotherwise Games! Just tweet, and tag @BoardgamesDaily and @TheologyofGames using the hashtag #CalltoAdventure and tell us your character name and Origins story in 280 characters or less!! And we'll pick a winner on May 6! Today we pit two rival social deduction games against each other: The Resistance vs. Coup!!! Who wins!? You decide!! Check out our brand new Spreadshop at shop.spreadshirt.com/theology-of-games you can find all sorts of sweet gear! You can now be on the show! Call tel: 216-352-3864 and leave us a message! Don’t forget to head to TheologyofGames.com/Patreon to find out all of the sweet rewards we have for our patrons and how you can become a part of what we do — if you like what you hear it would be awesome if you’d share this show with a friend, or subscribe, rate and review us in iTunes and Google Play! Or better yet use that nifty applause feature in the Anchor app! You can find more about Boardgames Daily, and Theology of Games at http://Theologyofgames.com! Don't forget to check out our sponsors! Brotherwise Games! Check out Call to Adventure a sweet new hero crafting game! Pre-order it right now, right here! Also, check out our written review of Call to Adventure RIGHT HERE! Or listen to Jeremiah's review of it on That's How I Roll RIGHT HERE! Today Jeremiah gives us his 1st Impression of Sailing Towards Osiris, and also it's our Kickstarter Weekly segment! Brought to you by Banastronaut Games and Hit List Check it out here! Check out our brand new Spreadshop at shop.spreadshirt.com/theology-of-games you can find all sorts of sweet gear! You can now be on the show! Call tel:216-352-3864 and leave us a message! Don’t forget to head to TheologyofGames.com/Patreon to find out all of the sweet rewards we have for our patrons and how you can become a part of what we do — if you like what you hear it would be awesome if you’d share this show with a friend, or subscribe, rate and review us in iTunes and Google Play! Or better yet use that nifty applause feature in the Anchor app! You can find more about Boardgames Daily, and Theology of Games at http://Theologyofgames.com! 269 - What Makes a Great Podcast??? Don't forget to check out our sponsors! Brotherwise Games! Check out Call to Adventure a sweet new hero crafting game! Pre-order it right now, right here! Today we start this week's topic: What makes a great podcast!?" Let us know what you look for in a gaming podcast! Also, AJ brings his final impressions of Raccoon Tycoon. Check out our brand new Spreadshop at shop.spreadshirt.com/theology-of-games you can find all sorts of sweet gear! You can now be on the show! Call tel:216-352-3864 and leave us a message! Don’t forget to head to TheologyofGames.com/Patreon to find out all of the sweet rewards we have for our patrons and how you can become a part of what we do — if you like what you hear it would be awesome if you’d share this show with a friend, or subscribe, rate and review us in iTunes and Google Play! Or better yet use that nifty applause feature in the Anchor app! You can find more about Boardgames Daily, and Theology of Games at http://Theologyofgames.com! Will You Quest for Candy? or for Life? Don't forget to check out our sponsors! Brotherwise Games! Check out Call to Adventure a sweet new hero crafting game! Pre-order it right now, right here! Today we kick off a new Cage Fight between Candy Land and the Game of LIfe! And we announce the winner of our contest for a copy of Space Park from Keymaster Games!! Check out our brand new Spreadshop at https://shop.spreadshirt.com/theology-of-games you can find all sorts of sweet gear! You can now be on the show! Call tel:216-352-3864 and leave us a message! Don’t forget to head to http://TheologyofGames.com/Patreon to find out all of the sweet rewards we have for our patrons and how you can become a part of what we do — if you like what you hear it would be awesome if you’d share this show with a friend, or subscribe, rate and review us in iTunes and Google Play! Or better yet use that nifty applause feature in the Anchor app! You can find more about Boardgames Daily, and Theology of Games at http://Theologyofgames.com! Don't forget to check out our sponsors! Brotherwise Games! Check out Call to Adventure a sweet new hero crafting game! Pre-order it right now, right here! We’ve got a couple of new Kickstarter fakes to talk about in Kickstarter Weekly, and AJ talks about some of his favorite 5-player games. Check out our brand new Spreadshop at https://shop.spreadshirt.com/theology-of-games you can find all sorts of sweet gear! You can now be on the show! Call tel:216-352-3864 and leave us a message! Don’t forget to head to http://TheologyofGames.com/Patreon to find out all of the sweet rewards we have for our patrons and how you can become a part of what we do — if you like what you hear it would be awesome if you’d share this show with a friend, or subscribe, rate and review us in iTunes and Google Play! Or better yet use that nifty applause feature in the Anchor app! You can find more about Boardgames Daily, and Theology of Games at http://Theologyofgames.com! Don't forget to check out our sponsors! Brotherwise Games! Check out Call to Adventure a sweet new hero crafting game! Pre-order it right now, right here! Today we’ve got news about an Inis expansion, a scary story about Chinese censorship, and the Question of the Week: What is the best bird game for exactly 5 players? Check out our brand new Spreadshop at https://shop.spreadshirt.com/theology-of-games you can find all sorts of sweet gear! You can now be on the show! Call tel:216-352-3864 and leave us a message! Don’t forget to head to http://TheologyofGames.com/Patreon to find out all of the sweet rewards we have for our patrons and how you can become a part of what we do — if you like what you hear it would be awesome if you’d share this show with a friend, or subscribe, rate and review us in iTunes and Google Play! Or better yet use that nifty applause feature in the Anchor app! You can find more about Boardgames Daily, and Theology of Games at http://Theologyofgames.com! Don't forget to check out our sponsors! Brotherwise Games! Check out Call to Adventure a sweet new hero crafting game! Pre-order it right now, right here! Today we’ve got a new Cage Fight, pitting Fluxx vs. Munchkin. And we also have news about a brand new game coming from USAopoly based on the movie Die Hard! Check out our brand new Spreadshop at https://shop.spreadshirt.com/theology-of-games you can find all sorts of sweet gear! You can now be on the show! Call tel:216-352-3864 and leave us a message! Don’t forget to head to http://TheologyofGames.com/Patreon to find out all of the sweet rewards we have for our patrons and how you can become a part of what we do — if you like what you hear it would be awesome if you’d share this show with a friend, or subscribe, rate and review us in iTunes and Google Play! Or better yet use that nifty applause feature in the Anchor app! You can find more about Boardgames Daily, and Theology of Games at http://Theologyofgames.com! We hear from AJ as he tells about his most memorable gaming experience—with a Kraken! Firestone is diving headlong into the Pathfinder RPG. And our Kickstarter Weekly post highlights the new Root expansion, and a new roll and write game from Perplext. Thanks for listening! 263 - Awesome Tales of Awesomeness! Don't forget to check out our sponsors! Brotherwise Games! Check out Call to Adventure a sweet new hero crafting game! Pre-order it right now, right here! Another thing you shouldn't forget is to enter our contest for a free copy of Space Park from Keymaster Games! Go here for all the details! Today we kick off a new topic!! What was one of your most exciting gaming moments!? Was it that time on the last possible roll of the dice you and your friends defeated the big baddie at the end of a co-op game? Let us know!! Also, AJ brings his first impressions of Raccoon Tycoon. And AJ and Jeremiah Cleanup Root! Check out our brand new Spreadshop at https://shop.spreadshirt.com/theology-of-games you can find all sorts of sweet gear! You can now be on the show! Call tel:216-352-3864 and leave us a message! Don’t forget to head to http://TheologyofGames.com/Patreon to find out all of the sweet rewards we have for our patrons and how you can become a part of what we do — if you like what you hear it would be awesome if you’d share this show with a friend, or subscribe, rate and review us in iTunes and Google Play! Or better yet use that nifty applause feature in the Anchor app! You can find more about Boardgames Daily, and Theology of Games at http://Theologyofgames.com! 262 The Godfather vs. Lords of Waterdeep! This week's cage fight pits The Godfather against Lords of Waterdeep! Also. What would you buy, if money was no object, what one game would you go buy right now!?! That's the question facing Jeremiah, help him out!! Check out our brand new Spreadshop at https://shop.spreadshirt.com/theology-of-games you can find all sorts of sweet gear! You can now be on the show! Call tel:216-352-3864 and leave us a message! Don’t forget to head to http://TheologyofGames.com/Patreon to find out all of the sweet rewards we have for our patrons and how you can become a part of what we do — if you like what you hear it would be awesome if you’d share this show with a friend, or subscribe, rate and review us in iTunes and Google Play! Or better yet use that nifty applause feature in the Anchor app! You can find more about Boardgames Daily, and Theology of Games at http://Theologyofgames.com! Dune, Daggers, and Doktors—It’s Friday! Powered by Brotherwise Games • What’s In Store Today • Dune is Getting Reprinted, by Gale Force Nine • 1st Impression: Tower of Madness from Smirk & Dagger Games • Firestone’s Cage Fight Winner: Herr Doktor! • That’s a Wrap! 261 - It's a new take on an old segment! The Cleanup with Call to Adventure! Don't forget to check out our sponsors! Brotherwise Games! Check out Call to Adventure a sweet new hero crafting game! Pre-order it right now, right here! Perplext Games and their new game on Kickstarter: Roland Wright! A roll & write (& erase) game! Now on Kickstarter until March 29th, 2019! Check it out right here! Today we chat about a whole bunch of games! We introduce a new take on our 1st Impressions segment, the Cleanup! AJ and Jeremiah clean up a game and share their thoughts on it fresh off the game table! Today they look at Call to Adventure! We also start this week's topic, what pillar games are in your collections!? Check out our brand new Spreadshop at https://shop.spreadshirt.com/theology-of-games you can find all sorts of sweet gear! You can now be on the show! Call tel:216-352-3864 and leave us a message! Don’t forget to head to http://TheologyofGames.com/Patreon to find out all of the sweet rewards we have for our patrons and how you can become a part of what we do — if you like what you hear it would be awesome if you’d share this show with a friend, or subscribe, rate and review us in iTunes and Google Play! Or better yet use that nifty applause feature in the Anchor app! You can find more about Boardgames Daily, and Theology of Games at http://Theologyofgames.com! 260 - The Fight Rages on! Quest for El Dorado vs. Jamaica! FIRST! Brotherwise Games! Check out Call to Adventure a sweet new hero crafting game! Pre-order it right now, right here! Today we bring you the results of last week's battle between Catan and Carcassonne (you are all so smart and brilliant!!) And if that wasn't enough, we're launching a new contest today, you can win a copy of Space Park from Keymaster Games just by being on our mailing list! Head over to the site and sign up!! AND if THAT wasn't enough, Firestone has some cool news about Restoration Games! We also kick off a new cage fight! Check out our brand new Spreadshop at https://shop.spreadshirt.com/theology-of-games you can find all sorts of sweet gear! You can now be on the show! Call tel:216-352-3864 and leave us a message! Don’t forget to head to http://TheologyofGames.com/Patreon to find out all of the sweet rewards we have for our patrons and how you can become a part of what we do — if you like what you hear it would be awesome if you’d share this show with a friend, or subscribe, rate and review us in iTunes and Google Play! Or better yet use that nifty applause feature in the Anchor app! You can find more about Boardgames Daily, and Theology of Games at http://Theologyofgames.com! 259 - Kickstarter Weekly is here! FIRST! Brotherwise Games! Check out Call to Adventure a sweet new hero crafting game! Pre-order it right now, right here! Second! Whoah. We have so much for you today! Let's start with Kickstarter Weekly! **Featured Campaign** Roland Wright Check it out here! Feudum: Rudders and Ramparts expansion Check it out here! Railroad Rivals: The Baron Robber Expansion Check it out here! We'll also hear from Adam Rehberg about his newest game Thrive, and AJ drops in with his thoughts on this week's topic: What game snuck up and surprised you because of its style of play!? If that wasn't enough, Memoir '44 is getting another expansion and Firestone is here to bring you that news! Check out our brand new Spreadshop at https://shop.spreadshirt.com/theology-of-games you can find all sorts of sweet gear! You can now be on the show! Call tel:216-352-3864 and leave us a message! Don’t forget to head to http://TheologyofGames.com/Patreon to find out all of the sweet rewards we have for our patrons and how you can become a part of what we do — if you like what you hear it would be awesome if you’d share this show with a friend, or subscribe, rate and review us in iTunes and Google Play! Or better yet use that nifty applause feature in the Anchor app! You can find more about Boardgames Daily, and Theology of Games at http://Theologyofgames.com! 258 - Wednesdays are for conversations. FIRST! We have to thank our two new sponsors! Brotherwise Games! Check out Call to Adventure a sweet new hero crafting game! Pre-order it right now, right here! Perplext Games and their new game on Kickstarter: Roland Wright! A roll & write (& erase) game! Now on Kickstarter until March 29th, 2019! Check it out right here! Firestone is gonna kick us off with a new topic for today, as we discus games that completely surprised us with their gameplay i.e. Firestone completely did NOT see the wargame mechanics of Root coming from this cute little woodland creature themed game! Check out our brand new Spreadshop at https://shop.spreadshirt.com/theology-of-games you can find all sorts of sweet gear! You can now be on the show! Call tel:216-352-3864 and leave us a message! Don’t forget to head to http://TheologyofGames.com/Patreon to find out all of the sweet rewards we have for our patrons and how you can become a part of what we do — if you like what you hear it would be awesome if you’d share this show with a friend, or subscribe, rate and review us in iTunes and Google Play! Or better yet use that nifty applause feature in the Anchor app! You can find more about Boardgames Daily, and Theology of Games at http://Theologyofgames.com! 257 - Carcassonne vs. Catan! Who Wins!?!? That's right!! This week the Game Night Cage Fight is a doozy!! It's Carcassonne vs. Settlers of Catan! Who wins?? You decide!! Vote on Twitter @BoardgamesDaily or promote your pick by calling the hotline 216-352-3864! Check out our brand new Spreadshop at https://shop.spreadshirt.com/theology-of-games you can find all sorts of sweet gear! You can now be on the show! Call tel:216-352-3864 and leave us a message! Don’t forget to head to http://TheologyofGames.com/Patreon to find out all of the sweet rewards we have for our patrons and how you can become a part of what we do — if you like what you hear it would be awesome if you’d share this show with a friend, or subscribe, rate and review us in iTunes and Google Play! Or better yet use that nifty applause feature in the Anchor app! You can find more about Boardgames Daily, and Theology of Games at http://Theologyofgames.com! Tiffany Caires of Haba Games USA is Here! Today Jeremiah chats with Tiffany Caires of Haba Games USA and he also weighs in on the Con season and what he looks forward to. AJ takes a quick look at Five Year Mission from Mayfair Games, and if that wasn't enough it's KIckstarter weekly and a 1st Impression of Kanban!! Buckle up buttercup, it's Boardgames Daily!! There's still time to get in on the Tiny Epic Contest!! Go to http://Theologyofgames.com And you can enter to win a copy of every DELUXE version of every Tiny Epic Game plus a sweet Game Haul bag to carry them in!! All that is courtesy of our Friends at Gamelyn Games!! Check out our brand new Spreadshop at https://shop.spreadshirt.com/theology-of-games you can find all sorts of sweet gear! You can now be on the show! Call tel:216-352-3864 and leave us a message! Don’t forget to head to http://TheologyofGames.com/Patreon to find out all of the sweet rewards we have for our patrons and how you can become a part of what we do — if you like what you hear it would be awesome if you’d share this show with a friend, or subscribe, rate and review us in iTunes and Google Play! Or better yet use that nifty applause feature in the Anchor app! You can find more about Boardgames Daily, and Theology of Games at http://Theologyofgames.com! Gaming Con Season and another look at Crusaders from Tasty Minstrel! It's time for this week's topic: What do you love about gaming conventions!? Also Jeremiah and AJ give us their 1st Impression of Crusaders: They Will Be Done from Tasty Minstrel Games! Don't forget to sign up early and often for our Tiny Epic Contest! You can enter by going to Theologyofgames.com! And on the blog today we posted our written review of Freedom: The Underground Railroad from Academy Games! Find that here: https://www.theologyofgames.com/theology-of-games/2019/2/24/free-at-last-a-double-take-review-of-freedom-the-underground-railroad You can now be on the show! Call 216-352-3864 and leave us a message! Don’t forget to head to TheologyofGames.com/Patreon to find out all of the sweet rewards we have for our patrons and how you can become a part of what we do — if you like what you hear it would be awesome if you’d share this show with a friend, or subscribe, rate and review us in iTunes and Google Play! Or better yet use that nifty applause feature in the Anchor app! You can find more about Boardgames Daily, and Theology of Games at Theologyofgames.com! It's a 3 Way Cage FIGHT!! That's right we've got a three way Game Night Cage Fight!! It's Mexica vs Tikal vs. Java! Vote on our @BoardgamesDaily twitter page! Also Jeremiah brings us his 1st Impressions of Most Wanted from North Star Games! Check out our brand new Spreadshop at https://shop.spreadshirt.com/theology-of-games you can find all sorts of sweet gear! You can now be on the show! Call tel:216-352-3864 and leave us a message! Don’t forget to head to http://TheologyofGames.com/Patreon to find out all of the sweet rewards we have for our patrons and how you can become a part of what we do — if you like what you hear it would be awesome if you’d share this show with a friend, or subscribe, rate and review us in iTunes and Google Play! Or better yet use that nifty applause feature in the Anchor app! You can find more about Boardgames Daily, and Theology of Games at http://Theologyofgames.com! Kickstarter Weekly, and more thoughts about Kickstarters that passed us by! Today we take a look at some very cool new Kickstarter campaigns, we continue the conversation about Kickstarters we lament missing out on. And MORE! Don't forget our Tiny Epic Contest!!! Win all of the Deluxe Tiny Epic Games from our good friends at Gamelyn Games! Enter by going to https://Theologyofgames.com Do it today!! Check out our brand new Spreadshop at https://shop.spreadshirt.com/theology-of-games you can find all sorts of sweet gear! You can now be on the show! Call tel:216-352-3864 and leave us a message! Don’t forget to head to http://TheologyofGames.com/Patreon to find out all of the sweet rewards we have for our patrons and how you can become a part of what we do — if you like what you hear it would be awesome if you’d share this show with a friend, or subscribe, rate and review us in iTunes and Google Play! Or better yet use that nifty applause feature in the Anchor app! You can find more about Boardgames Daily, and Theology of Games at http://Theologyofgames.com! We Gotta Go Back in Time! Which Kickstarter did you miss out on!? Today we ask the Question of the Week! Which Kickstarter would you go back and back If you could!? Also Jeremiah weighs in on this week's Game Night Cage Fight and we have a call in vote from Gamer Leaf. Don't forget our Tiny Epic Contest! Win $300 worth of Deluxe Tiny Epic games and a custom Game Haul bag to carry them in from our good friends at Gamelyn Games, just head to http://Theologyofgames.com to enter! And check out Tiny Epic Tactics on Kickstarter right now! Check out our brand new Spreadshop at https://shop.spreadshirt.com/theology-of-games you can find all sorts of sweet gear! You can now be on the show! Call tel:216-352-3864 and leave us a message! Don’t forget to head to http://TheologyofGames.com/Patreon to find out all of the sweet rewards we have for our patrons and how you can become a part of what we do — if you like what you hear it would be awesome if you’d share this show with a friend, or subscribe, rate and review us in iTunes and Google Play! Or better yet use that nifty applause feature in the Anchor app! You can find more about Boardgames Daily, and Theology of Games at http://Theologyofgames.com! Today we bring you the results of last week's Cage Fight between Race for the Galaxy, and Roll for the Galaxy. And we kick of a new Cage Fight with Pandemic and Pandemic: The Cure. Plus AJ makes a 1st Impression with Ganz Shon Clever. Don't forget our Tiny Epic Contest!!! Go to the site to enter! Check out our brand new Spreadshop at https://shop.spreadshirt.com/theology-of-games you can find all sorts of sweet gear! You can now be on the show! Call tel:216-352-3864 and leave us a message! Don’t forget to head to http://TheologyofGames.com/Patreon to find out all of the sweet rewards we have for our patrons and how you can become a part of what we do — if you like what you hear it would be awesome if you’d share this show with a friend, or subscribe, rate and review us in iTunes and Google Play! Or better yet use that nifty applause feature in the Anchor app! You can find more about Boardgames Daily, and Theology of Games at http://Theologyofgames.com! The Battle Wages ON! Gloomhaven vs. RPGs!! Today the debate continues on this week's topic! Is it worth it to play Gloomhaven instead of a traditional RPG!? Don't forget our Tiny Epic Contest!! Win $300 worth of games from our friends at Gamelyn Games! Go RIGHT HERE to enter!! Check out our brand new Spreadshop at https://shop.spreadshirt.com/theology-of-games you can find all sorts of sweet gear! You can now be on the show! Call tel:216-352-3864 and leave us a message! Don’t forget to head to http://TheologyofGames.com/Patreon to find out all of the sweet rewards we have for our patrons and how you can become a part of what we do — if you like what you hear it would be awesome if you’d share this show with a friend, or subscribe, rate and review us in iTunes and Google Play! Or better yet use that nifty applause feature in the Anchor app! You can find more about Boardgames Daily, and Theology of Games at http://Theologyofgames.com! Is GloomHaven D&D lite? Descent has a new expansion! Today we introduce the weekly topic and it's a doozy! "Why Not Just Play and RPG?" Jeremiah questions the need for games like Gloomhaven in the space of narrative based dungeon crawlers. Scott brings us news about the latest Descent expansion that was just announced! And AJ weighs in on this week's Game Night Cage Fight! What are you waiting for!! Start listening now!!! Here's the contest link we mention too: TheologyofGames.com Check out our brand new Spreadshop at https://shop.spreadshirt.com/theology-of-games you can find all sorts of sweet gear! You can now be on the show! Call tel:216-352-3864 and leave us a message! Don’t forget to head to http://TheologyofGames.com/Patreon to find out all of the sweet rewards we have for our patrons and how you can become a part of what we do — if you like what you hear it would be awesome if you’d share this show with a friend, or subscribe, rate and review us in iTunes and Google Play! Or better yet use that nifty applause feature in the Anchor app! You can find more about Boardgames Daily, and Theology of Games at http://Theologyofgames.com! Gloomhaven and Our Weekly Cage FIGHT! Today we're talking, Gloomhaven as AJ and Jeremiah finally begin their campaign tonight! We also launch a new Game Night Cage Fight! It's Roll for the Galaxy vs. Race for the Galaxy! Head to our Twitter page @BoardgamesDaily to cast your vote! Don't forget our Tiny Epic Contest! Win a deluxe copy of every Tiny Epic Game plus a custom Game Haul to carry them around in!! Just head to our website RIGHT HERE to enter! Check out our brand new Spreadshop at https://shop.spreadshirt.com/theology-of-games you can find all sorts of sweet gear! You can now be on the show! Call tel:216-352-3864 and leave us a message! Don’t forget to head to http://TheologyofGames.com/Patreon to find out all of the sweet rewards we have for our patrons and how you can become a part of what we do — if you like what you hear it would be awesome if you’d share this show with a friend, or subscribe, rate and review us in iTunes and Google Play! Or better yet use that nifty applause feature in the Anchor app! You can find more about Boardgames Daily, and Theology of Games at http://Theologyofgames.com! Today we have sooooo much for you! Alan Gerding of Tuesday Knight Games stops by, Firestone gives us his first impressions of Gugong, and we chat Top 10 of 2018!! And don’t forget our Tiny Epic Contest!!! Boardgames Daily show notes Check out our brand new Spreadshop at https://shop.spreadshirt.com/theology-of-games you can find all sorts of sweet gear! You can now be on the show! Call tel:216-352-3864 and leave us a message! Don’t forget to head to http://TheologyofGames.com/Patreon to find out all of the sweet rewards we have for our patrons and how you can become a part of what we do — if you like what you hear it would be awesome if you’d share this show with a friend, or subscribe, rate and review us in iTunes and Google Play! Or better yet use that nifty applause feature in the Anchor app! You can find more about Boardgames Daily, and Theology of Games at http://Theologyofgames.com! Today we start up our next Topic of the Week: Games You Want your Spouse (or significant other) to Play but they Won't! Plus our friend Tim Heerema drops by to give us an update on Archmage and the new expansion hitting the market VERY soon! You can check out our written review of Archmage HERE, or listen to Jeremiah's review on That's How I Roll RIGHT HERE! Don't forget to check out our TINY EPIC CONTEST! Head to TheologyofGames.com and click "Enter the Contest" for full details! Check out our brand new Spreadshop at https://shop.spreadshirt.com/theology-of-games you can find all sorts of sweet gear! You can now be on the show! Call tel:216-352-3864 and leave us a message! Don’t forget to head to http://TheologyofGames.com/Patreon to find out all of the sweet rewards we have for our patrons and how you can become a part of what we do — if you like what you hear it would be awesome if you’d share this show with a friend, or subscribe, rate and review us in iTunes and Google Play! Or better yet use that nifty applause feature in the Anchor app! You can find more about Boardgames Daily, and Theology of Games at http://Theologyofgames.com! BIG CONTEST! And a Cage Fight! We're back at the contest thing this month as we are giving away a DELUXE copy of EVERY TINY EPIC GAME! (Kingdoms, Heroes' Call, Defenders, Defenders Dark War, Galaxies, Beyond the Black, Western, Quest, and Zombies!) Not only that! You'll receive a free Game Haul bag for carrying around all of that Tiny Epic-ness! Go to TheologyofGames.com and click the button that will take you to the contest!! Or go right here! https://www.theologyofgames.com/theology-of-games/tinyepiccontest As if that wasn't exciting enough, we've got the results of last week's Game Night Cage Fight and we kick off another one!! This week we're pitting Hannabi vs. The Mind! Check out our brand new Spreadshop at https://shop.spreadshirt.com/theology-of-games you can find all sorts of sweet gear! You can now be on the show! Call tel:216-352-3864 and leave us a message! Don’t forget to head to http://TheologyofGames.com/Patreon to find out all of the sweet rewards we have for our patrons and how you can become a part of what we do — if you like what you hear it would be awesome if you’d share this show with a friend, or subscribe, rate and review us in iTunes and Google Play! Or better yet use that nifty applause feature in the Anchor app! You can find more about Boardgames Daily, and Theology of Games at http://Theologyofgames.com! Today we continue chatting about this week's topic: What designers do you just impulse buy? Firestone gives us his 1st impressions of Crusaders: Thy Will Be Done. Check out our brand new Spreadshop at https://shop.spreadshirt.com/theology-of-games you can find all sorts of sweet gear! You can now be on the show! Call tel:216-352-3864 and leave us a message! Don’t forget to head to http://TheologyofGames.com/Patreon to find out all of the sweet rewards we have for our patrons and how you can become a part of what we do — if you like what you hear it would be awesome if you’d share this show with a friend, or subscribe, rate and review us in iTunes and Google Play! Or better yet use that nifty applause feature in the Anchor app! You can find more about Boardgames Daily, and Theology of Games at http://Theologyofgames.com! Topic of the Week, and *ahem* a contest?? It's another fun episode for ya, we've got this week's topic: Which Game Designer will you Impulse Buy? Also a 1st Impression of The Mind. And Jeremiah spills the beans on a HUGE upcoming contest!! Check out our brand new Spreadshop at https://shop.spreadshirt.com/theology-of-games you can find all sorts of sweet gear! You can now be on the show! Call tel:216-352-3864 and leave us a message! Don’t forget to head to http://TheologyofGames.com/Patreon to find out all of the sweet rewards we have for our patrons and how you can become a part of what we do — if you like what you hear it would be awesome if you’d share this show with a friend, or subscribe, rate and review us in iTunes and Google Play! Or better yet use that nifty applause feature in the Anchor app! You can find more about Boardgames Daily, and Theology of Games at http://Theologyofgames.com! Gamer Leaf Stops by for a Chat! Today we have a great show! Gamer Leaf of Getting Geeky with Gamer Leaf stops by to chat gaming and have a little fun with our Game Night Cage Fight, which is Cthulhu Realms vs. Star Realms this week! We also get the results of last week's Game Night Cage Fight, and AJ brings us some Kickstarter news as well! Buckle up for a jam packed episode! Check out Gamer Leaf and his show at www.GamerLeafGo.com! Boardgames Daily show notes Check out our brand new Spreadshop at https://shop.spreadshirt.com/theology-of-games you can find all sorts of sweet gear! You can now be on the show! Call tel: 216-352-3864 and leave us a message! Don’t forget to head to http://TheologyofGames.com/Patreon to find out all of the sweet rewards we have for our patrons and how you can become a part of what we do — if you like what you hear it would be awesome if you’d share this show with a friend, or subscribe, rate and review us in iTunes and Google Play! Or better yet use that nifty applause feature in the Anchor app! You can find more about Boardgames Daily, and Theology of Games at http://Theologyofgames.com! Today we continue this week's topic: Are minis killing cards? And Firestone gives a 1st Impression review of Blackout: Hong Kong. And don't forget our contest! Go to TheologyofGames.com for all the details! You can now be on the show! Call 216-352-3864 and leave us a message! Don’t forget to head to TheologyofGames.com/Patreon to find out all of the sweet rewards we have for our patrons and how you can become a part of what we do — if you like what you hear it would be awesome if you’d share this show with a friend, or subscribe, rate and review us in iTunes and Google Play! Or better yet use that nifty applause feature in the Anchor app! You can find more about Boardgames Daily, and Theology of Games at Theologyofgames.com! AJ got to play the hot game Wingspan, and gives you his thoughts. And AJ & Jeremiah weigh in on whether miniatures games are killing Card games. Join in the conversation, and thanks for listening! Today we bring you the results of last week's Game Night Cage Fight and start up another brawl, between Yokohama and Istanbul! Check out our brand new Spreadshop at https://shop.spreadshirt.com/theology-of-games you can find all sorts of sweet gear! You can now be on the show! Call tel:216-352-3864 and leave us a message! Don’t forget to head to http://TheologyofGames.com/Patreon to find out all of the sweet rewards we have for our patrons and how you can become a part of what we do — if you like what you hear it would be awesome if you’d share this show with a friend, or subscribe, rate and review us in iTunes and Google Play! Or better yet use that nifty applause feature in the Anchor app! You can find more about Boardgames Daily, and Theology of Games at http://Theologyofgames.com! King Me! A Look at Sleeve Kings Sleeves, Shadow & Claw, and Space Base! We’ve got some cool stuff coming at you today, including a look at the Sleeve Kings from Mayday Games! Here are today’s segments Anchor • Soce Base Craziness• BGD-1st-Impressions • Sleeve Kings• Shadow & Claw • Boardgames Daily show notes Check out our brand new Spreadshop at https://shop.spreadshirt.com/theology-of-games you can find all sorts of sweet gear! You can now be on the show! Call tel:216-352-3864 and leave us a message! Don’t forget to head to http://TheologyofGames.com/Patreon to find out all of the sweet rewards we have for our patrons and how you can become a part of what we do — if you like what you hear it would be awesome if you’d share this show with a friend, or subscribe, rate and review us in iTunes and Google Play! Or better yet use that nifty applause feature in the Anchor app! You can find more about Boardgames Daily, and Theology of Games at http://Theologyofgames.com! Topic Tuesday: What About Gaming Still Excites You? Today we bring in Topic Tuesday (on a Wednesday) and we ask What about gaming still excited you? Also. We need your hell renaming Topic Tuesday for our Wednesday show! And AJ gives us his 1st Impression of End of the Trail! Boardgames Daily show notes Check out our brand new Spreadshop at https://shop.spreadshirt.com/theology-of-games you can find all sorts of sweet gear! You can now be on the show! Call tel:216-352-3864 and leave us a message! Don’t forget to head to http://TheologyofGames.com/Patreon to find out all of the sweet rewards we have for our patrons and how you can become a part of what we do — if you like what you hear it would be awesome if you’d share this show with a friend, or subscribe, rate and review us in iTunes and Google Play! Or better yet use that nifty applause feature in the Anchor app! You can find more about Boardgames Daily, and Theology of Games at http://Theologyofgames.com! Petz Vs. Lords who wins?? We’ve started another Cage Fight!! This week it’s Dungeon Pets vs. Dungeon Lords! Who wins?? You decide!! Boardgames Daily show notes Check out our brand new Spreadshop at https://shop.spreadshirt.com/theology-of-games you can find all sorts of sweet gear! You can now be on the show! Call tel:216-352-3864 and leave us a message! Don’t forget to head to http://TheologyofGames.com/Patreon to find out all of the sweet rewards we have for our patrons and how you can become a part of what we do — if you like what you hear it would be awesome if you’d share this show with a friend, or subscribe, rate and review us in iTunes and Google Play! Or better yet use that nifty applause feature in the Anchor app! You can find more about Boardgames Daily, and Theology of Games at http://Theologyofgames.com! Today the guys discuss some first and second impressions of Legends of Andor Dark Heroes, and Newton. And we continue this week's topic of games we've "discovered" this past year! Boardgames Daily show notes Check out our brand new Spreadshop at https://shop.spreadshirt.com/theology-of-games you can find all sorts of sweet gear! You can now be on the show! Call tel: 216-352-3864 and leave us a message! Don’t forget to head to http://TheologyofGames.com/Patreon to find out all of the sweet rewards we have for our patrons and how you can become a part of what we do — if you like what you hear it would be awesome if you’d share this show with a friend, or subscribe, rate and review us in iTunes and Google Play! Or better yet use that nifty applause feature in the Anchor app! You can find more about Boardgames Daily, and Theology of Games at http://Theologyofgames.com! Topic Tuesday the Great Games we “Discovered” in 2018! Today AJ talks about the great discoveries in board gaming that we made in 2018! Also Jeremiah gives his 1st Impression of Big Dig from Tasty Minstrel Games! Boardgames Daily show notes Check out our brand new Spreadshop at https://shop.spreadshirt.com/theology-of-games you can find all sorts of sweet gear! You can now be on the show! Call tel:216-352-3864 and leave us a message! Don’t forget to head to http://TheologyofGames.com/Patreon to find out all of the sweet rewards we have for our patrons and how you can become a part of what we do — if you like what you hear it would be awesome if you’d share this show with a friend, or subscribe, rate and review us in iTunes and Google Play! Or better yet use that nifty applause feature in the Anchor app! You can find more about Boardgames Daily, and Theology of Games at http://Theologyofgames.com! Game Night Cage Fight! Dungeons fight it out! This week we pit Dungeon Raiders from Devir Games vs. Dungeon Roll from Tasty Minstrel! Who wins? You decide! Boardgames Daily show notes Check out our brand new Spreadshop at https://shop.spreadshirt.com/theology-of-games you can find all sorts of sweet gear! You can now be on the show! Call tel:216-352-3864 and leave us a message! Don’t forget to head to http://TheologyofGames.com/Patreon to find out all of the sweet rewards we have for our patrons and how you can become a part of what we do — if you like what you hear it would be awesome if you’d share this show with a friend, or subscribe, rate and review us in iTunes and Google Play! Or better yet use that nifty applause feature in the Anchor app! You can find more about Boardgames Daily, and Theology of Games at http://Theologyofgames.com! We’re back! The holidays are over and it’s time to get back to talking about board games. AJ shares his Christmas haul, and Firestone gives his first impressions of a fun new word game:Trapwords! Thanks for listening! Topic Tuesday and a Game Night Cage Fight! It’s time for you to weigh in on this week’s Game Night Cage Fight and our Topic Tuesday! And you can help us with our special Christmas episode!! You can now be on the show! Call 216-352-3864 and leave us a message! Don’t forget to head to TheologyofGames.com/Patreon to find out all of the sweet rewards we have for our patrons and how you can become a part of what we do — if you like what you hear it would be awesome if you’d share this show with a friend, or subscribe, rate and review us in iTunes and Google Play! Or better yet use that nifty applause feature in the Anchor app! You can find more about Boardgames Daily, and Theology of Games at Theologyofgames.com! Black Orchestra, 12 Days of Christmas, and More! Today Jeremiah talks Black Orchestra from Starling Games, we have a winner for day 4 of the 12 Days of Christmas contest, and some holiday gaming discussion! You can now be on the show! Call 216-352-3864 and leave us a message! Don’t forget to head to TheologyofGames.com/Patreon to find out all of the sweet rewards we have for our patrons and how you can become a part of what we do — if you like what you hear it would be awesome if you’d share this show with a friend, or subscribe, rate and review us in iTunes and Google Play! Or better yet use that nifty applause feature in the Anchor app! You can find more about Boardgames Daily, and Theology of Games at Theologyofgames.com! Game Night Cage Fight! Splendor v. Century Spice Road! Who wins?? Who will win?? You decide!! Head over to twitter @BoardgamesDaily or call in 216-352-3864 and cast your vote!! You can now be on the show! Call 216-352-3864 and leave us a message! Don’t forget to head to TheologyofGames.com/Patreon to find out all of the sweet rewards we have for our patrons and how you can become a part of what we do — if you like what you hear it would be awesome if you’d share this show with a friend, or subscribe, rate and review us in iTunes and Google Play! Or better yet use that nifty applause feature in the Anchor app! You can find more about Boardgames Daily, and Theology of Games at Theologyofgames.com! Is this Topic Tuesday? Ticket to Ride? Gift Guide? What's happening??? We've got more topics to discuss, and LOTS of new games hitting the table! You can now be on the show! Call 216-352-3864 and leave us a message! Don’t forget to head to TheologyofGames.com/Patreon to find out all of the sweet rewards we have for our patrons and how you can become a part of what we do — if you like what you hear it would be awesome if you’d share this show with a friend, or subscribe, rate and review us in iTunes and Google Play! Or better yet use that nifty applause feature in the Anchor app! You can find more about Boardgames Daily, and Theology of Games at Theologyofgames.com! We've got a TON of catching up to do so hang on tight because they're all coming at ya! Wanna weigh in on Topic Tuesday?? DO IT! Call 216-352-3864 and leave us a message! Don’t forget to head to TheologyofGames.com/Patreon to find out all of the sweet rewards we have for our patrons and how you can become a part of what we do — if you like what you hear it would be awesome if you’d share this show with a friend, or subscribe, rate and review us in iTunes and Google Play! Or better yet use that nifty applause feature in the Anchor app! You can find more about Boardgames Daily, and Theology of Games at Theologyofgames.com! What’s happening with PAX Unplugged. We're catching up on some old episodes from last week!! Here's a bit of news about PAXU and more! Way late but still good! This episode got lost in the ether world for a while and has finally made its way to a downloadable podcast. Catching yo in lost time!! Today we’re catching up on some episodes that were scheduled for last week! You can now be on the show! Call 216-352-3864 and leave us a message! Don’t forget to head to TheologyofGames.com/Patreon to find out all of the sweet rewards we have for our patrons and how you can become a part of what we do — if you like what you hear it would be awesome if you’d share this show with a friend, or subscribe, rate and review us in iTunes and Google Play! Or better yet use that nifty applause feature in the Anchor app! You can find more about Boardgames Daily, and Theology of Games at Theologyofgames.com! Thanksgiving Games: Hit or Miss? In this episode we focused highly on our topic Tuesday. We discussed games that hit well with our family and games that are a total miss. Thankfully we got this show done! It’s Topic Tuesday as we give thanks! You can now be on the show! Call 216-352-3864 and leave us a message! Don’t forget to head to TheologyofGames.com/Patreon to find out all of the sweet rewards we have for our patrons and how you can become a part of what we do — if you like what you hear it would be awesome if you’d share this show with a friend, or subscribe, rate and review us in iTunes and Google Play! Or better yet use that nifty applause feature in the Anchor app! You can find more about Boardgames Daily, and Theology of Games at Theologyofgames.com! Game Night Cage Fight!! Onitama vs. The Duke!! It’s time for this week’s Game Night Cage Fight!! This week we are pitting Onitama vs. The Duke!! Who wins? Go to Twitter @BoardgamesDaily and vote! Or call in 216-352-3864 and cast your vote and state your case!! You can now be on the show! Call 216-352-3864 and leave us a message! Don’t forget to head to TheologyofGames.com/Patreon to find out all of the sweet rewards we have for our patrons and how you can become a part of what we do — if you like what you hear it would be awesome if you’d share this show with a friend, or subscribe, rate and review us in iTunes and Google Play! Or better yet use that nifty applause feature in the Anchor app! You can find more about Boardgames Daily, and Theology of Games at Theologyofgames.com! Run for You Life Candyman!! Today Jeremiah and AJ give their first impressions of the latest from Smirk & Dagger: Run for Your Life Candyman!! You can now be on the show! Call 216-352-3864 and leave us a message! Don’t forget to head to TheologyofGames.com/Patreon to find out all of the sweet rewards we have for our patrons and how you can become a part of what we do — if you like what you hear it would be awesome if you’d share this show with a friend, or subscribe, rate and review us in iTunes and Google Play! Or better yet use that nifty applause feature in the Anchor app! You can find more about Boardgames Daily, and Theology of Games at Theologyofgames.com! It’s Friday, Friday, gotta get down on Friday! We talk Friday night gaming, Atlantis Rising, and a new Kickstarter for some pretty sweet sleeves! You can now be on the show! Call 216-352-3864 and leave us a message! Don’t forget to head to TheologyofGames.com/Patreon to find out all of the sweet rewards we have for our patrons and how you can become a part of what we do — if you like what you hear it would be awesome if you’d share this show with a friend, or subscribe, rate and review us in iTunes and Google Play! Or better yet use that nifty applause feature in the Anchor app! You can find more about Boardgames Daily, and Theology of Games at Theologyofgames.com! FIGHT FIGHT It's a Cage Fight! New York vs. Tokyo! Today the guys are talking about this week's Game Night Cage Fight! King of Tokyo vs. King of New York! Who wins? You decide! Call in 216-352-3864 and cast your vote! Or go to @BoardgamesDaily on Twitter! And of course you can always get in on the action by becoming a member of our Patreon community! Head to TheologyofGames.com/patreon for more info! We’ve got a packed episode! AJ recounts his adventures in Spirit Island. We hear some sad news about Artipia Games getting robbed at Essen—but a clever way to deal with it. And for Topic Tuesday we discuss the games in the Top 100 that we’ve never played. Join the conversation! Someone is turning 100! Star Realms News and more! Today’s Jeremiah talks about the 100th episode of That’s How I Roll, What he played over the weekend, and AJ talks about game night and news about Star Realms! You can now be on the show! Call 216-352-3864 and leave us a message! Don’t forget to head to TheologyofGames.com/Patreon to find out all of the sweet rewards we have for our patrons and how you can become a part of what we do — if you like what you hear it would be awesome if you’d share this show with a friend, or subscribe, rate and review us in iTunes and Google Play! Or better yet use that nifty applause feature in the Anchor app! You can find more about Boardgames Daily, and Theology of Games at Theologyofgames.com! It’s what will you play Friday!? Also AJ weighs in on this week’s Game Night Cage Fight! You can now be on the show! Call 216-352-3864 and leave us a message! Don’t forget to head to TheologyofGames.com/Patreon to find out all of the sweet rewards we have for our patrons and how you can become a part of what we do — if you like what you hear it would be awesome if you’d share this show with a friend, or subscribe, rate and review us in iTunes and Google Play! Or better yet use that nifty applause feature in the Anchor app! You can find more about Boardgames Daily, and Theology of Games at Theologyofgames.com! This week’s Game Night Cage Fight is here!! We’re putting Coup up against the Resistance!! Who will win?? You decide!! You can now be on the show! Call 216-352-3864 and leave us a message! Don’t forget to head to TheologyofGames.com/Patreon to find out all of the sweet rewards we have for our patrons and how you can become a part of what we do — if you like what you hear it would be awesome if you’d share this show with a friend, or subscribe, rate and review us in iTunes and Google Play! Or better yet use that nifty applause feature in the Anchor app! You can find more about Boardgames Daily, and Theology of Games at Theologyofgames.com! In this episode we give some first impressions of “Zombs”, “Koi” and the expansion to “Imhotep” as well as discuss essential reprints. The very first episode of Boardgames Daily! To Sleeve or not To Sleeve!?!? Today the guys talk about sleeving your cards, do you do it? Which games do you Sleeve? And there’s a new way to call in!! Call tel:(216) 352-3864 and leave a message and you’ll be on the show!! Don’t forget to head to TheologyofGames.com/Patreon to find out all of the sweet rewards we have for our patrons and how you can become a part of what we do — if you like what you hear it would be awesome if you’d share this show with a friend, or subscribe, rate and review us in iTunes and Google Play! Or better yet use that nifty applause feature in the Anchor app! You can find more about Boardgames Daily, and Theology of Games at Theologyofgames.com! Is it Monday?? Is it Friday!! Regardless what day it is, it’s time for a Game Night Cage Fight!!! Lords of Waterdeep vs. Viticulture. Don’t forget to head to TheologyofGames.com/Patreon to find out all of the sweet rewards we have for our patrons and how you can become a part of what we do — if you like what you hear it would be awesome if you’d share this show with a friend, or subscribe, rate and review us in iTunes and Google Play! Or better yet use that nifty applause feature in the Anchor app! You can find more about Boardgames Daily, and Theology of Games at Theologyofgames.com! The Must Have Expansion! What’s Yours?? Today the guys talk about board game expansions! Which ones you must have in your collection! Don’t forget to head to TheologyofGames.com/Patreon to find out all of the sweet rewards we have for our patrons and how you can become a part of what we do — if you like what you hear it would be awesome if you’d share this show with a friend, or subscribe, rate and review us in iTunes and Google Play! Or better yet use that nifty applause feature in the Anchor app! You can find more about Boardgames Daily, and Theology of Games at Theologyofgames.com! AJ talks about game night, and the Spirit Island Kickstarter goes live! Asmodee and Nintendo Super Mario Smallworld?? Today we chat about gaming over the weekend, and AJ reports on the news the Asmodee is bringing gamesto the Nintendo Switch! Don’t forget to head to TheologyofGames.com/Patreon to find out all of the sweet rewards we have for our patrons and how you can become a part of what we do — if you like what you hear it would be awesome if you’d share this show with a friend, or subscribe, rate and review us in iTunes and Google Play! Or better yet use that nifty applause feature in the Anchor app! You can find more about Boardgames Daily, and Theology of Games at Theologyofgames.com! Today we kick off this week’s Game Night Cage Fight it’s Imperial Assualt vs. Mansions of Madness (2nd Edition) let us know who wins!!! Don’t forget to head to TheologyofGames.com/Patreon to find out all of the sweet rewards we have for our patrons and how you can become a part of what we do — if you like what you hear it would be awesome if you’d share this show with a friend, or subscribe, rate and review us in iTunes and Google Play! Or better yet use that nifty applause feature in the Anchor app! You can find more about Boardgames Daily, and Theology of Games at Theologyofgames.com! Today we start off Topic Tuesday with a discussion on Pick up and Deliver games. Don’t forget to head to TheologyofGames.com/Patreon to find out all of the sweet rewards we have for our patrons and how you can become a part of what we do — if you like what you hear it would be awesome if you’d share this show with a friend, or subscribe, rate and review us in iTunes and Google Play! Or better yet use that nifty applause feature in the Anchor app! You can find more about Boardgames Daily, and Theology of Games at Theologyofgames.com! It's our 200th episode! We've updated our contest, and we have all sorts of great stuff for you today!! Check it out and tell your friends!! — if you like what you hear it would be awesome if you’d share this show with a friend, or subscribe, rate and review us in iTunes and Google Play! Or better yet use that nifty applause feature in the Anchor app! You can find more about Boardgames FM, and Theology of Games at Theologyofgames.com! The abstracted time show!?? What day is it again??? Catching up on some business from earlier this week!! Contest!!! — if you like what you hear it would be awesome if you’d share this show with a friend, or subscribe, rate and review us in iTunes and Google Play! Or better yet use that nifty applause feature in the Anchor app! You can find more about Boardgames FM, and Theology of Games at Theologyofgames.com! In this episode our topic Tuesday explores games that lived up to their hype as well as features games recently finding their way to the table like Charterstone. We also include for you a contest to win the game Before There Were Stars. Having some technical difficulties but here’s Friday’s episode. Monday’s episode is coming on Tuesday??? Don’t forget to head to TheologyofGames.com/Patreon to find out all of the sweet rewards we have for our patrons and how you can become a part of what we do — if you like what you hear it would be awesome if you’d share this show with a friend, or subscribe, rate and review us in iTunes and Google Play! Or better yet use that nifty applause feature in the Anchor app! You can find more about Boardgames Daily, and Theology of Games at Theologyofgames.com! New Sponsor! Brass, and Cage Fight updates! Today we welcome a new sponsor to the show, Getting Geeky with Gamer Leaf GamerLeafGo.com and Scott breaks down the new Brass titles while Jeremiah brings an update to the Game Night Cage Fight! Don’t forget to head to TheologyofGames.com/Patreon to find out all of the sweet rewards we have for our patrons and how you can become a part of what we do — if you like what you hear it would be awesome if you’d share this show with a friend, or subscribe, rate and review us in iTunes and Google Play! Or better yet use that nifty applause feature in the Anchor app! You can find more about Boardgames Daily, and Theology of Games at Theologyofgames.com! Today we unleash the Game night Cage Fight segment on you! Who will win??? It’s up to you! Look for our poll on Twitter @BoardgamesDaily! This week it’s Carcassonne vs. Kingdomino! Don’t forget to head to TheologyofGames.com/Patreon to find out all of the sweet rewards we have for our patrons and how you can become a part of what we do — if you like what you hear it would be awesome if you’d share this show with a friend, or subscribe, rate and review us in iTunes and Google Play! Or better yet use that nifty applause feature in the Anchor app! You can find more about Boardgames Daily, and Theology of Games at Theologyofgames.com! Michael Coe of Gamelyn Games! And Topic Tuesday!! Today Jeremiah Chats with Michael Coe of Gamelyn Games about Tiny Epic Mechs and Gamelyn Games! Also this week’s topic is over hyped games! Don’t forget to head to TheologyofGames.com/Patreon to find out all of the sweet rewards we have for our patrons and how you can become a part of what we do — if you like what you hear it would be awesome if you’d share this show with a friend, or subscribe, rate and review us in iTunes and Google Play! Or better yet use that nifty applause feature in the Anchor app! You can find more about Boardgames Daily, and Theology of Games at Theologyofgames.com! What was Your Weekend like?? Today the guys discuss what they played over the weekend! Not forget our contest!! Win a copy of Tower of Madness from Smirk & Dagger Games! Don’t forget to head to TheologyofGames.com/Patreon to find out all of the sweet rewards we have for our patrons and how you can become a part of what we do — if you like what you hear it would be awesome if you’d share this show with a friend, or subscribe, rate and review us in iTunes and Google Play! Or better yet use that nifty applause feature in the Anchor app! You can find more about Boardgames Daily, and Theology of Games at Theologyofgames.com! Will you play? More Diamond in the rough! Today the guys talk about what they will play this weekend, and we bring your thoughts to the conversation about diamonds in the rough. Games you thought were very underrated! And AJ talks about games from Arcane Wonders that are releasing soon! Don’t forget to head to TheologyofGames.com/Patreon to find out all of the sweet rewards we have for our patrons and how you can become a part of what we do — if you like what you hear it would be awesome if you’d share this show with a friend, or subscribe, rate and review us in iTunes and Google Play! Or better yet use that nifty applause feature in the Anchor app! You can find more about Boardgames Daily, and Theology of Games at Theologyofgames.com! Diamond in the Rough Games! Today the guys discuss Games that cake out of nowhere to really surprise them! Don’t forget our Tower of Madness Contest! Don’t forget to head to TheologyofGames.com/Patreon to find out all of the sweet rewards we have for our patrons and how you can become a part of what we do — if you like what you hear it would be awesome if you’d share this show with a friend, or subscribe, rate and review us in iTunes and Google Play! Or better yet use that nifty applause feature in the Anchor app! You can find more about Boardgames Daily, and Theology of Games at Theologyofgames.com! Contest! Pandemic turns 10! And more! Today the guys chat about what’s hitting the table, keep you updated on the contest we’re running, and discuss 10 years of Pandemic! Don’t forget to head to TheologyofGames.com/Patreon to find out all of the sweet rewards we have for our patrons and how you can become a part of what we do — if you like what you hear it would be awesome if you’d share this show with a friend, or subscribe, rate and review us in iTunes and Google Play! Or better yet use that nifty applause feature in the Anchor app! You can find more about Boardgames Daily, and Theology of Games at Theologyofgames.com! Contest!!!! We’re giving away Tower of Madness! Yes! We’re giving away a copy of Tower of Madness from Smirk & Dagger to one of our first 25 patrons on our Patreon Page! Also it’s What Will You Play Friday!! Don’t forget to head to TheologyofGames.com/Patreon to find out all of the sweet rewards we have for our patrons and how you can become a part of what we do — if you like what you hear it would be awesome if you’d share this show with a friend, or subscribe, rate and review us in iTunes and Google Play! Or better yet use that nifty applause feature in the Anchor app! You can find more about Boardgames Daily, and Theology of Games at Theologyofgames.com! Today on the show we announce a cool contest for a copy of the Tower of Madness from Smirk & Dagger. Jeremiah interviews Randy Hoyt from Foxtrot Games. Firestone talks social deduction, and AJ looks at Before There Were Stars. Don’t forget to head to TheologyofGames.com/Patreon to find out all of the sweet rewards we have for our patrons and how you can become a part of what we do — if you like what you hear it would be awesome if you’d share this show with a friend, or subscribe, rate and review us in iTunes and Google Play! Or better yet use that nifty applause feature in the Anchor app! You can find more about Boardgames Daily, and Theology of Games at Theologyofgames.com! A LARPING We Will Go!! It’s a special what will you play Friday!! AJ and Jeremiah are LARPing tonight! It’s Escape Room time! What are you playing this weekend!!?? Don’t forget to head to TheologyofGames.com/Patreon to find out all of the sweet rewards we have for our patrons and how you can become a part of what we do — if you like what you hear it would be awesome if you’d share this show with a friend, or subscribe, rate and review us in iTunes and Google Play! Or better yet use that nifty applause feature in the Anchor app! You can find more about Boardgames Daily, and Theology of Games at Theologyofgames.com! LOTR app is it worth it? Today the guys discuss the latest App from Asmodee Digital: The Lord of the Rings LCG app. It’s not being well received... Don’t forget to head to TheologyofGames.com/Patreon to find out all of the sweet rewards we have for our patrons and how you can become a part of what we do — if you like what you hear it would be awesome if you’d share this show with a friend, or subscribe, rate and review us in iTunes and Google Play! Or better yet use that nifty applause feature in the Anchor app! You can find more about Boardgames Daily, and Theology of Games at Theologyofgames.com! To Trade? Or Not to Trade? Today it’s Topic Tuesday! And we’re talking trading games on the geek! Don’t forget to head to TheologyofGames.com/Patreon to find out all of the sweet rewards we have for our patrons and how you can become a part of what we do — if you like what you hear it would be awesome if you’d share this show with a friend, or subscribe, rate and review us in iTunes and Google Play! Or better yet use that nifty applause feature in the Anchor app! You can find more about Boardgames Daily, and Theology of Games at Theologyofgames.com! What did the Weekend Hold? Today the guys talk weekend gaming, Stone Age Anniversary Edition, and the merger of Tabletop Tycoon and Victory Point Games. Don’t forget to head to TheologyofGames.com/Patreon to find out all of the sweet rewards we have for our patrons and how you can become a part of what we do — if you like what you hear it would be awesome if you’d share this show with a friend, or subscribe, rate and review us in iTunes and Google Play! Or better yet use that nifty applause feature in the Anchor app! You can find more about Boardgames Daily, and Theology of Games at Theologyofgames.com! What Will You Play this Weekend? Today the guys discuss their gaming plans for the weekend and Firestone gives us a quick look at Shadowrun: Zero Day and Istanbul the Dice Game! Don’t forget to head to TheologyofGames.com/Patreon to find out all of the sweet rewards we have for our patrons and how you can become a part of what we do — if you like what you hear it would be awesome if you’d share this show with a friend, or subscribe, rate and review us in iTunes and Google Play! Or better yet use that nifty applause feature in the Anchor app! You can find more about Boardgames Daily, and Theology of Games at Theologyofgames.com! What Are You Dying to Play? Today the gang is discussing Games they are just dying to get to the table! Don’t forget to head to TheologyofGames.com/Patreon to find out all of the sweet rewards we have for our patrons and how you can become a part of what we do — if you like what you hear it would be awesome if you’d share this show with a friend, or subscribe, rate and review us in iTunes and Google Play! Or better yet use that nifty applause feature in the Anchor app! You can find more about Boardgames Daily, and Theology of Games at Theologyofgames.com! Today Jeremiah and AJ chat about last night's game night, including a 1st Impression review of Capital City from Calliope Games! Boardgames Daily show notes Check out our brand new Spreadshop at https://shop.spreadshirt.com/theology-of-games you can find all sorts of sweet gear! You can now be on the show! Call tel:216-352-3864 and leave us a message! Don’t forget to head to http://TheologyofGames.com/Patreon to find out all of the sweet rewards we have for our patrons and how you can become a part of what we do — if you like what you hear it would be awesome if you’d share this show with a friend, or subscribe, rate and review us in iTunes and Google Play! Or better yet use that nifty applause feature in the Anchor app! You can find more about Boardgames Daily, and Theology of Games at http://Theologyofgames.com! TOG Top Rated, Merger Publishers and much more!! Today’s show is JAM packed! We talk everything from what we’ve been playing to merging game publishers plus some exciting things happening over at TheologyofGames.com/BGD Don’t forget to head to TheologyofGames.com/Patreon to find out all of the sweet rewards we have for our patrons and how you can become a part of what we do — if you like what you hear it would be awesome if you’d share this show with a friend, or subscribe, rate and review us in iTunes and Google Play! Or better yet use that nifty applause feature in the Anchor app! You can find more about Boardgames Daily, and Theology of Games at Theologyofgames.com! In this episode Firestone and A.J. talk about the final hours of the Thunderstone Quest kickstarter campaign as well as Gale Force Nine, and Thames and Kosmos games. Everdell and More News from Fantasy Flight! Today the guys talk about EverDell and the news of another unique game from Fantasy Flight games. Boardgames Daily show notes Check out our brand new Spreadshop at https://shop.spreadshirt.com/theology-of-games you can find all sorts of sweet gear! You can now be on the show! Call tel:216-352-3864 and leave us a message! Don’t forget to head to http://TheologyofGames.com/Patreon to find out all of the sweet rewards we have for our patrons and how you can become a part of what we do — if you like what you hear it would be awesome if you’d share this show with a friend, or subscribe, rate and review us in iTunes and Google Play! Or better yet use that nifty applause feature in the Anchor app! You can find more about Boardgames Daily, and Theology of Games at http://Theologyofgames.com! Jeremiah takes the show for today and chats about the sweet listener support feature here on Anchor as well as “What Will you Play Friday”! Let us know what you’re playing this weekend! Don’t forget to head to TheologyofGames.com/Patreon to find out all of the sweet rewards we have for our patrons and how you can become a part of what we do — if you like what you hear it would be awesome if you’d share this show with a friend, or subscribe, rate and review us in iTunes and Google Play! Or better yet use that nifty applause feature in the Anchor app! You can find more about Boardgames Daily, and Theology of Games at Theologyofgames.com! The gan's all here! Today the guys discuss one of the hottest games announced at Gen Con: Keyforge! Firestone takes a look at the Gloomhaven Organizer from The Broken Token, AND there's a NEW and EASY way to support Boardgames Daily! Anchor.FM has launched a new listener support feature that we are excited and proud to be a part of launching, today, right now!! Visit our page on a mobile or desktop browser, and click the support button. That's it, you can even use Apple or Google Pay! Stay tuned because we'll be hosting an awesome contest very soon for our supporters exclusively here on Anchor! For all things Theology of Games check out TheologyofGames.com! Thanks for listening! Today Firestone and AJ chat about a few games that have been hitting their tables! Don’t forget to head to TheologyofGames.com/Patreon to find out all of the sweet rewards we have for our patrons and how you can become a part of what we do — if you like what you hear it would be awesome if you’d share this show with a friend, or subscribe, rate and review us in iTunes and Google Play! Or better yet use that nifty applause feature in the Anchor app! You can find more about Boardgames Daily, and Theology of Games at Theologyofgames.com! Today it’s what will you play Friday! Plus AJ and Scott weigh in with their 1st Impressions of Great Western Trail and Freedom: The Underground Railroad. Don’t forget to head to TheologyofGames.com/Patreon to find out all of the sweet rewards we have for our patrons and how you can become a part of what we do — if you like what you hear it would be awesome if you’d share this show with a friend, or subscribe, rate and review us in iTunes and Google Play! Or better yet use that nifty applause feature in the Anchor app! You can find more about Boardgames Daily, and Theology of Games at Theologyofgames.com! House Rules! Gen Con! And MORE! Today we field a call asking about best practices for House Rules. Jeremiah and Firestone sound off on what makes a good house rule, in their opinion... Also Jeremiah gives us the low down on a couple more titles that should be on your radar if you're heading to Gen Con! Don't forget to head over to www.TheologyofGames.com/Patreon to find out how you can be a part of what we do here at Boardgames Daily! And don't forget to subscribe, rate and review the show wherever you may be listening! Have a great day, and go play some games!! Topic Tuesday! Gen Con or Gen Can’t? Today Jeremiah discusses Gen Con, and some titles you want to check out while you’re there! Don’t forget to head to TheologyofGames.com/Patreon to find out all of the sweet rewards we have for our patrons and how you can become a part of what we do — if you like what you hear it would be awesome if you’d share this show with a friend, or subscribe, rate and review us in iTunes and Google Play! Or better yet use that nifty applause feature in the Anchor app! You can find more about Boardgames Daily, and Theology of Games at Theologyofgames.com! 169 - Asmodee North America CEO Steps Down! Today Jeremiah and Firestone chat about what they played this weekend and we just found out the CEO of Asmodee North America has stepped down! Don’t forget to head to TheologyofGames.com/Patreon to find out all of the sweet rewards we have for our patrons and how you can become a part of what we do — if you like what you hear it would be awesome if you’d share this show with a friend, or subscribe, rate and review us in iTunes and Google Play! Or better yet use that nifty applause feature in the Anchor app! You can find more about Boardgames Daily, and Theology of Games at Theologyofgames.com! It’s What Will You Play Friday!? Let us know what’s hitting the table this weekend! Don’t forget to head to TheologyofGames.com/Patreon to find out all of the sweet rewards sd have for our patrons and how you can become a part of what we do — if you like what you hear it would be awesome if you’d share this show with a friend, or subscribe, rate and review us in iTunes and Google Play! Or better yet use that nifty applause feature in the Anchor app! You can find more about Boardgames Daily, and Theology of Games at Theologyofgames.com! Hit Z Road, Raids and more! Today AJ and Firestone weigh in with their first impressions of Raids, Hit Z Road, and Indian Summer! Don't forget to check out our Patreon page! Visit www.theologyofGames.com/Patreon to find out how you can become a part of what we do! If you like what you hear, take a second to share the show with your friends, subscribe, rate and review us wherever you're listening! And if you're listening on the Anchor app use that sweet voice message feature and you too can be a part of the show! Today, Firestone weighs in on the Asmodee sale (he’s not so hopeful...) and Jeremiah gives his 1st Impressions of Imhotep from Kosmos & Thames. Don’t forget to head to TheologyofGames.com/Patreon to find out all of the sweet rewards sd have for our patrons and how you can become a lart of what we do — if you like what you hear it would be awesome if you’d share this show with a friend, or subscribe, rate and review us in iTunes and Google Play! Or better yet use that nifty applause feature in the Anchor app! You can find more about Boardgames Daily, and Theology of Games at Theologyofgames.com! Today we chat about the Spiel winners, the sale of Asmodee, and more! It’s Boardgames Daily!! Don’t forget! We’re on Patreon! Theologyofgames.com/Patreon — if you like what you hear it would be awesome if you’d share this show with a friend, or subscribe, rate and review us in iTunes and Google Play! Or better yet use that nifty applause feature in the Anchor app! You can find more about Boardgames Daily, and Theology of Games at Theologyofgames.com! It’s What Will You Play Friday?? Whatcha planning on playing this weekend!? We’re talking weekend gaming plans and Firestone adds to this week’s topic of Boardgame expansions. Don’t forget to head over to theologyofgames.com/Patreon and check out all of the sweet rewards that are waiting for you! — if you like what you hear it would be awesome if you’d share this show with a friend, or subscribe, rate and review us in iTunes and Google Play! Or better yet use that nifty applause feature in the Anchor app! You can find more about Boardgames Daily, and Theology of Games at Theologyofgames.com! Today Jeremiah chats about some news pieces in the world of Kickstarter. Trogdor and Thunderstone! Don’t forget to head over to TheologyofGames.com/Patreon to become a part of what we’re doing here on Boardgames Daily and score some sweet rewards as well! — if you like what you hear it would be awesome if you’d share this show with a friend, or subscribe, rate and review us in iTunes and Google Play! Or better yet use that nifty applause feature in the Anchor app! You can find more about Boardgames Daily, and Theology of Games at Theologyofgames.com! Topic Tuesday - Hanamikoji and More! Today the guys discuss boardgames expansions for today’s topic. They also discuss the games they played over the weekend, which include: Orleans, Star Realms Frontiers, and of course Hanamikoji which jeremiah gives his First Impression review of! Don’t Forget to check out our Patreon page to become a part of the team! Patreon.com/theologyofgames — if you like what you hear it would be awesome if you’d share this show with a friend, or subscribe, rate and review us in iTunes and Google Play! Or better yet use that nifty applause feature in the Anchor app! You can find more about Boardgames Daily, and Theology of Games at Theologyofgames.com! AJ and Jeremiah weigh in on this week's "what will you play Friday" topic. What are you playing?! Hit us up on social media @TheologyofGames on Twitter, Instagram and Facebook and of course @BoardgamesDaily on Twitter as well! If you are enjoying Boardgames Daily, we would sure love it if you gave us a rating, and a review on whatever platform you're listening on! AND! Don't forget to check out our Patreon page at TheologyofGames.com/Patreon! Thursday News - Grackles and more! Today Jeremiah is at the helm today with lots of news pieces for you with news from: AEG, Starling Games, Calliope Games and Deep Water Games! Jeremiah also does a First Take Review of Grackles from Fireside Games. If you enjoy Boardgames Daily be sure to subscribe, rate and review us on iTunes, Google Play, Spotify or wherever you may be listening! If you want to get in on the show you can always use the Voice Message feature to respond to the topics we chat about here on Boardgames Daily! Today Jeremiah kicks off this week's topic with a conversation about games that get second editions (and third, and fourth etc.). Jeremiah brings a few titles to the table that prove the need for them, while also chatting about some examples that didn't do so well... If you like what you hear, we'd LOVE it if you shared this show with someone who would like it too, also if you would rate, review, and subscribe wherever you're listening we would greatly appreciate it! And lastly if you head over to TheologyofGames.com/Patreon you can find out all about our Patreon community and how you can join us and get some cool rewards in the process! See you tomorrow! Monday: Dungeon Raiders - High Society and more! Hey gang! Today the guys finish up some Origins coverage, and chat about what's been on the table recently which includes, Scythe, High Society (the reprint of the Knizia classic!) and Dungeon Raiders (2nd edition!) As alway we love it if you share the show with other, rate, review, subscribe wherever you may be listening, and of course you can be a part of the show via the Anchor app! Today Jeremiah chats with Folks from the floor at Origins, and AJ chats about some standouts from the show! — if you like what you hear it would be awesome if you’d share this show with a friend, or subscribe, rate and review us in iTunes and Google Play! Or better yet use that nifty applause feature in the Anchor app! You can find more about Boardgames Daily, and Theology of Games at Theologyofgames.com! Today we talk with a few folks from the floor at Origins. Today’s guests are: Matrix and Kyle from Keymaster Games and Mark Swanson of Feudum! — if you like what you hear it would be awesome if you’d share this show with a friend, or subscribe, rate and review us in iTunes and Google Play! Or better yet use that nifty applause feature in the Anchor app! You can find more about Boardgames Daily, and Theology of Games at Theologyofgames.com! Boardgames Daily! Season 2! Origins 2018! We’re at Origins, stop booth 359, and say hi grab a few stickers, and a code card that will get you in on the fun of our Flash prizes!! Go to theologyofgames.com to enter our sweet contests! — if you like what you hear it would be awesome if you’d share this show with a friend, or subscribe, rate and review us in iTunes and Google Play! Or better yet use that nifty applause feature in the Anchor app! You can find more about Boardgames Daily, and Theology of Games at Theologyofgames.com! In this episode, Firestone talks about the hot negotiation game Sidereal Confluence, and we've got news about more Thunderstone Quest coming your way, and Part 2 of the Origins Sneak Peek. Check it out! Let's take a look at Origins Game Fair 2018!! AJ talks about the newly announced Spiel des Jahres nominees, what he played this weekend, and the Edge of Darkness Kickstarter. Two Rooms, Asmodee and What Will You Play? We’ve got a ton of conversation going on today! Jeremiah drops some big news about our Indiegogo campaign! You can now get a copy of 2 Rooms and a Boom! Or World Championship Russian Roulette at the $30 backer level check it here: http://igg.me/at/TOGorigins/x/17971696 on top of that, it’s What Will You Play Friday, and there is big news that Asmodee is up for sale!! — if you like what you hear it would be awesome if you’d share this show with a friend, or subscribe, rate and review us in iTunes and Google Play! Or better yet use that nifty applause feature in the Anchor app! You can find more about Boardgames FM, and Theology of Games at Theologyofgames.com! AJ brings us news about the future of Love Letter, and Firestone played Power Grid: The Card Game at game night, and gives his impressions. Today we chat about the latest updates to our Indiegogo Campaign, Gloomhaven, some cool Kickstarter happenings, and much more! Join the conversation using the Anchor app! You can find our Indiegogo campaign here: https://igg.me/at/TOGorigins/x/17971696 If you like what you hear, ratings and reviews on iTunes and Google Play or wherever you're listening would be greatly appreciated! Jeremiah talk what will You Play, and more! — if you like what you hear it would be awesome if you’d share this show with a friend, or subscribe, rate and review us in iTunes and Google Play! Or better yet use that nifty applause feature in the Anchor app! You can find more about Boardgames FM, and Theology of Games at Theologyofgames.com! Today AJ takes on the episode solo, and chats Thunderstone, building your own Crokinole board and more! Don't forget if you share our Indiegogo campaign you can win some sweet prizes! https://igg.me/at/TOGorigins/x/17971696 Thanks for listening! Today we discuss the latest news in Fantasy Flight's X-Wing line, and some odd happenings in the world of Kickstarter. Don't forget we're running our own Indiegogo Campaign! We're going to Origins Game Fair in June and you can be a part of it! Check out our campaign along with a great contest right here: https://igg.me/at/TOGorigins/x/17971696 If you're enjoying BGFM we'd love it if you subscribed, rated and even gave us a review on iTunes, Google Play or wherever you may be listening! Today the guys discuss the latest big box of Alhambra, and Decrypto the latest from Iello Games! — if you like what you hear it would be awesome if you’d share this show with a friend, or subscribe, rate and review us in iTunes and Google Play! Or better yet use that nifty applause feature in the Anchor app! You can find more about Boardgames FM, and Theology of Games at Theologyofgames.com! Today AJ and Jeremiah have a little chat about Plan B Games and their newest games Azul and Century: Eastern Wonders! Don’t forget our Indiegogo campaign is still up and running! Check it out here! http://igg.me/at/TOGorigins/x/17971696 — if you like what you hear it would be awesome if you’d share this show with a friend, or subscribe, rate and review us in iTunes and Google Play! Or better yet use that nifty applause feature in the Anchor app! You can find more about Boardgames FM, and Theology of Games at Theologyofgames.com! Big sale on Amazon! Are you Ready for Tabletop Day!? Today Jeremiah chats about the big deals happening on Amazon, International Tabletop Day, and our recently launched Indiegogo campaign!! If you want more info on the Indiegogo campaign check here: https://www.indiegogo.com/projects/send-theology-of-games-to-origins-game-fair/x/17971696#/ — if you like what you hear it would be awesome if you’d share this show with a friend, or subscribe, rate and review us in iTunes and Google Play! Or better yet use that nifty applause feature in the Anchor app! You can find more about Boardgames FM, and Theology of Games at Theologyofgames.com! In today’s episode Firestone talks about Dark Souls: The Card Game, and shares some news about the future of Fury of Dracula! Taxes, Fireballs, and Thunderstones, oh my! Today the guys discuss what they would do with tax return money, if, of course they were actually getting a return.... Jeremiah shares more details about the upcoming Theology of Games Indiegogo campaign, and a special live episode of That’s How I Roll! — if you like what you hear it would be awesome if you’d share this show with a friend, or subscribe, rate and review us in iTunes and Google Play! Or better yet use that nifty applause feature in the Anchor app! You can find more about Boardgames FM, and Theology of Games at Theologyofgames.com! Today the guys chat about crowdfunding, including Theology of Games launching an Indiegogo campaign! — if you like what you hear it would be awesome if you’d share this show with a friend, or subscribe, rate and review us in iTunes and Google Play! Or better yet use that nifty applause feature in the Anchor app! You can find more about Boardgames FM, and Theology of Games at Theologyofgames.com! Space Base - What Will You Play and more! Big episode today! We chat about Space Base, setting the mood for gaming, what we’re playing this weekend, and so much more! — if you like what you hear it would be awesome if you’d share this show with a friend, or subscribe, rate and review us in iTunes and Google Play! Or better yet use that nifty applause feature in the Anchor app! You can find more about Boardgames FM, and Theology of Games at Theologyofgames.com! Today the guys talk a bit about their latest game nights, and we have a cool conversation about games that are underrated! — if you like what you hear it would be awesome if you’d share this show with a friend, or subscribe, rate and review us in iTunes and Google Play! Or better yet use that nifty applause feature in the Anchor app! You can find more about Boardgames FM, and Theology of Games at Theologyofgames.com! Gaia vs. Terra Mystica, Eldritch Mis-haps and more! Today AJ weighs in on our Game Night Cage Fight, and the guys check in with what they’ve played over the weekend. And Jeremiah tries to figure out what mystery package is showing up tomorrow! — if you like what you hear it would be awesome if you’d share this show with a friend, or subscribe, rate and review us in iTunes and Google Play! Or better yet use that nifty applause feature in the Anchor app! You can find more about Boardgames FM, and Theology of Games at Theologyofgames.com! New Segment! FIGHT! FIGHT! FIGHT! Today we unveil a new segment on the show, Game Night Cage Fight! You can vote on the winner by leaving a voice message on Anchor or check out our twitter poll on our @TheologyofGames twitter page! There’s a ton more going on today so tune in, strap in, and let’s get rolling!! — if you like what you hear it would be awesome if you’d share this show with a friend, or subscribe, rate and review us in iTunes and Google Play! Or better yet use that nifty applause feature in the Anchor app! You can find more about Boardgames FM, and Theology of Games at Theologyofgames.com! Thunderstone, Gaia Project, and more! Today Firestone chats about his game night escapades which include Folklore and Thunderstone Quest! And Jeremiah gives his 1st impression of Gaia Project! — if you like what you hear it would be awesome if you’d share this show with a friend, or subscribe, rate and review us in iTunes and Google Play! Or better yet use that nifty applause feature in the Anchor app! You can find more about Boardgames FM, and Theology of Games at Theologyofgames.com! What we Played - Space Base 1St Impression! Today on BGFM, we talk Games we’ve played over the holiday weekend, we have a call in from Star Realms Mini-cast. And Jeremiah gives us a first impression of Space Base from AEG! — if you like what you hear it would be awesome if you’d share this show with a friend, or subscribe, rate and review us in iTunes and Google Play! Or better yet use that nifty applause feature in the Anchor app! You can find more about Boardgames FM, and Theology of Games at Theologyofgames.com! Space Base- What Will/Won’t You Play Friday!? Today Jeremiah and Firestone discuss Games they won’t play because of content and conviction. Also it’s What Will You Play Friday, and Jeremiah does a Rulebook Impression on Space Base the upcoming release from AEG! — if you like what you hear it would be awesome if you’d share this show with a friend, or subscribe, rate and review us in iTunes and Google Play! Or better yet use that nifty applause feature in the Anchor app! You can find more about Boardgames FM, and Theology of Games at Theologyofgames.com! Mayfair Games recently announced they were being acquired by Asmodee, a decision they made after serving the gaming community for decades! Today the guys reminisce on some of their top titles. — if you like what you hear it would be awesome if you’d share this show with a friend, or subscribe, rate and review us in iTunes and Google Play! Or better yet use that nifty applause feature in the Anchor app! You can find more about Boardgames FM, and Theology of Games at Theologyofgames.com! Weekend Gaming - Sonar - and more! Today the guys talk about what they played over the weekend, Jeremiah give a 1st Impression of Sonar (not Captain Sonar! ), and we got a message about 2 player gaming from Star Realms: Minicast! — if you like what you hear it would be awesome if you’d share this show with a friend, or subscribe, rate and review us in iTunes and Google Play! Or better yet use that nifty applause feature in the Anchor app! You can find more about Boardgames FM, and Theology of Games at Theologyofgames.com! There's lots to listen to, so sit tight! Super sized episode todsy as the guys discuss heavy 2-player games, and of course it's What Will You Play Friday! — if you like what you hear it would be awesome if you’d share this show with a friend, or subscribe, rate and review us in iTunes and Google Play! Or better yet use that nifty applause feature in the Anchor app! You can find more about Boardgames FM, and Theology of Games at Theologyofgames.com! More Gaia Project, Wordsy and more! Join in the conversation as the guys discuss the latest games to hit their tables! And Jeremiah gives his first impressions of Wordsy from Formal Ferret! — if you like what you hear it would be awesome if you’d share this show with a friend, or subscribe, rate and review us in iTunes and Google Play! Or better yet use that nifty applause feature in the Anchor app! You can find more about Boardgames FM, and Theology of Games at Theologyofgames.com! What’s hitting the table and Spring Break! Check it out! We are back after a crazy busy weekend, chatting about the games we played, and looking forward to spring break! Don’t forget you can be a part of the conversation by downloading the Anchor app! — if you like what you hear it would be awesome if you’d share this show with a friend, or subscribe, rate and review us in iTunes and Google Play! Or better yet use that nifty applause feature in the Anchor app! You can find more about Boardgames FM, and Theology of Games at Theologyofgames.com! Check out the latest episode of Boardgames FM! We’ve got a new sound and it’s pretty groovy! — if you like what you hear it would be awesome if you’d share this show with a friend, or subscribe, rate and review us in iTunes and Google Play! Or better yet use that nifty applause feature in the Anchor app! You can find more about Boardgames FM, and Theology of Games at Theologyofgames.com! Today AJ and Jeremiah chat about dead CCGs, and Firestone recaps his latest game night! — if you like what you hear it would be awesome if you’d share this show with a friend, or subscribe, rate and review us in iTunes and Google Play! Or better yet use that nifty applause feature in the Anchor app! You can find more about Boardgames FM, and Theology of Games at Theologyofgames.com! Today Jeremiah chats about his gateway Games, going all the way back to the early 90’s. — if you like what you hear it would be awesome if you’d share this show with a friend, or subscribe, rate and review us in iTunes and Google Play! Or better yet use that nifty applause feature in the Anchor app! You can find more about Boardgames FM, and Theology of Games at Theologyofgames.com! What were Your Gates Games? Today AJ starts a conversation about gateway Games that strengthened your love of the hobby, but no longer are a part of your collection! — if you like what you hear it would be awesome if you’d share this show with a friend, or subscribe, rate and review us in iTunes and Google Play! Or better yet use that nifty applause feature in the Anchor app! You can find more about Boardgames FM, and Theology of Games at Theologyofgames.com! Non-Interactive Games and a Shopping Spree! Today AJ and Jeremiah discuss two topics, Games that don’t promote interaction and a not-so-hypothetical questions about what you would do with $500 to spend on Games! — if you like what you hear it would be awesome if you’d share this show with a friend, or subscribe, rate and review us in iTunes and Google Play! Or better yet use that nifty applause feature in the Anchor app! You can find more about Boardgames FM, and Theology of Games at Theologyofgames.com! Thunderstone 1st impressions - What Will You Play??? Jeremiah gives his first impressions of Thunderstone Quest, does it takeover the top spot in deck building? Also it's What Will You Play Friday!? Let us know what's hitting your tables this week! — if you like what you hear it would be awesome if you’d share this show with a friend, or subscribe, rate and review us in iTunes and Google Play! Or better yet use that nifty applause feature in the Anchor app! You can find more about Boardgames FM, and Theology of Games at Theologyofgames.com! Today we chat about the weekend of gaming, and the latedt Werewords expansion which is now live on Kickstarter! — if you like what you hear it would be awesome if you’d share this show with a friend, or subscribe, rate and review us in iTunes and Google Play! Or better yet use that nifty applause feature in the Anchor app! You can find more about Boardgames FM, and Theology of Games at Theologyofgames.com! Firestone talks about his first impressions of the new hit game Rising Sun, from CMON. We played games this weekend!! What we actually played this weekend. What will you play this weekend! Let us know! Today we chat about Thunderstone Quest as AJ drools over his Kickstarter copy, Jeremiah starts a conversation about games to travel with, and also gives us a first impression of Purrrrlock Holmes. — if you like what you hear it would be awesome if you’d share this show with a friend, or subscribe, rate and review us in iTunes and Google Play! Or better yet use that nifty applause feature in the Anchor app! You can find more about Boardgames FM, and Theology of Games at Theologyofgames.com! Thunderstone is here! AJ backed the latest Thunderstone installment from AEG, and shares a bit about it today! — if you like what you hear it would be awesome if you’d share this show with a friend, or subscribe, rate and review us in iTunes and Google Play! Or better yet use that nifty applause feature in the Anchor app! You can find more about Boardgames FM, and Theology of Games at Theologyofgames.com! There is so much packed into today’s show!! Here are today’s segments: Morning Initiative—Feb. 16, 2018 • What Will You Play Friday?? #Boardgames #tabletop #bgg #cardgames #podcast • Wordsy/Thunderstone Quest • 2-Player Games: The Gipf Project • Call-in from Star Realms Minicast! • Solo weekend: Pandemic Legacy 2 and maybe Leaving Earth? • Game Night: First Class. — if you like what you hear it would be awesome if you’d share this show with a friend, or subscribe, rate and review us in iTunes and Google Play! Or better yet use that nifty applause feature in the Anchor app! You can find more about Boardgames FM, and Theology of Games at Theologyofgames.com! Today we have a shorter show featuring a call-in from a listener. Here are today’s segments:Call-in from Star Realms Minicast • Sushi Go Duel — if you like what you hear it would be awesome if you’d share this show with a friend, or subscribe, rate and review us in iTunes and Google Play! Or better yet use that nifty applause feature in the Anchor app! You can find more about Boardgames FM, and Theology of Games at Theologyofgames.com! AJ chats about his wife’s favorite 2-player Games. Firestone chats not about EthnosA spouses opinion on two player games • 2-Player Games: 7 Wonders Duel • Game Night: Ethnos — if you like what you hear it would be awesome if you’d share this show with a friend, or subscribe, rate and review us in iTunes and Google Play! Or better yet use that nifty applause feature in the Anchor app! You can find more about Boardgames FM, and Theology of Games at Theologyofgames.com! 2-player Games, Ethnos & More! Today we continue chatting about 2-Player Games, Jeremiah does a first impression of Ethnos from CMON, and much more! Don’t miss this one! Two player games continue • Ethnos!!! First Impressions #boardgames #CMON • A 2-Player Call In • Onitama • Jeremiah’s 2-Player Games. — if you like what you hear it would be awesome if you’d share this show with a friend, or subscribe, rate and review us in iTunes and Google Play! Or better yet use that nifty applause feature in the Anchor app! You can find more about Boardgames FM, and Theology of Games at Theologyofgames.com! Today we start a conversation on 2-Player Games, and Jeremiah chats with designer John D. Clair. The Godfather of Card Crafting and designer of Mystic Vale, Custom Heroes and the upcoming: Edge of Darkness!! Here are today’s segments: Morning Initiative—Feb 12, 2018 • Valentines two player game kick off • John D. Clair -Edge of Darkness designer Pt. 1 #Boardgames #Tabletop • John D. Clair -Edge of Darkness designer Pt. 2 #Boardgames #Tabletop — if you like what you hear it would be awesome if you’d share this show with a friend, or subscribe, rate and review us in iTunes and Google Play! Or better yet use that nifty applause feature in the Anchor app! You can find more about Boardgames FM, and Theology of Games at Theologyofgames.com! All kinds of good stuff for you today. Jeremiah talks Star Realms we have a call in and Jeremiah also does a first impression of Menu Masters from Calliope Games! Mornin initiative—Feb. 11, 2018 • What’s hitting the table • First call in of the day! • Star Realms? • Yes! We Love Star Realms! • Menu Masters by Calliope Games—First Impressions! — if you like what you hear it would be awesome if you’d share this show with a friend, or subscribe, rate and review us in iTunes and Google Play! Or better yet use that nifty applause feature in the Anchor app! You can find more about Boardgames FM, and Theology of Games at Theologyofgames.com! We kick off what will You Play Friday, talk Deck Building, and talk about the big news that broke today! Here are today’s segments: What will you play Friday and deck building • Breaking News: Asmodee buys Mayfair Games and Lookout Games • Reaction to breaking news. Mind blown! • Asmodee’s new acquisition—Get on the Trolley AJ! — if you like what you hear it would be awesome if you’d share this show with a friend, or subscribe, rate and review us in iTunes and Google Play! Or better yet use that nifty applause feature in the Anchor app! You can find more about Boardgames FM, and Theology of Games at Theologyofgames.com! Today Jeremiah gives his first impression of The Captain is Dead from AEG, and gives some thoughts on deck building games. Here are today’s segments: The Captain is Dead - First Impressions • Deck builders! Dominion is at the top of the heap! • Game Night Cage Fight! Sonar vs. Captain Sonar! — if you like what you hear it would be awesome if you’d share this show with a friend, or subscribe, rate and review us in iTunes and Google Play! Or better yet use that nifty applause feature in the Anchor app! You can find more about Boardgames FM, and Theology of Games at Theologyofgames.com! Today we continue discussing deck builders. Here are today’s segments: Game Night: Werewords and Burgle Bros. • Deck-Builder Offshoots: Orleans and Quarriors. — if you like what you hear it would be awesome if you’d share this show with a friend, or subscribe, rate and review us in iTunes and Google Play! Or better yet use that nifty applause feature in the Anchor app! You can find more about Boardgames FM, and Theology of Games at Theologyofgames.com! Today we start a discussion about deck builders! Here are today’s segments: Let’s talk deck building • Our first call in of the day... • Why I like deckbuilders • Deck-Builders! (DC, Arctic Scavengers, Ascension, Nightfall. — if you like what you hear it would be awesome if you’d share this show with a friend, or subscribe, rate and review us in iTunes and Google Play! Or better yet use that nifty applause feature in the Anchor app! You can find more about Boardgames FM, and Theology of Games at Theologyofgames.com! Here are today’s segments: We can recap, what actually hit the table. • The Patriots Lost!! — if you like what you hear it would be awesome if you’d share this show with a friend, or subscribe, rate and review us in iTunes and Google Play! Or better yet use that nifty applause feature in the Anchor app! You can find more about Boardgames FM, and Theology of Games at Theologyofgames.com! What Will U Play Friday?? So much packed into Themis episode as we ask and answer What Will You Play Friday?? And so much more! Here are today’s segments: Morning initiative – what will you play Friday • Spirit Island • What Will Jeremiah Play? • Take-Two Review: Campy Creatures on YouTube! #KeymasterGames • Table of Ultimate Gaming Pre-Order! #Boardgames #Table #Podcast — if you like what you hear it would be awesome if you’d share this show with a friend, or subscribe, rate and review us in iTunes and Google Play! Or better yet use that nifty applause feature in the Anchor app! You can find more about Boardgames FM, and Theology of Games at Theologyofgames.com! Today Jeremiah previews a couple Kickstarter campaigns! Here are today’s segments: Morning Initiative—More Kickstarter talk! • Space Park: Keymaster Games • Gentes Deluxified: Kickstarter Konversations. — if you like what you hear it would be awesome if you’d share this show with a friend, or subscribe, rate and review us in iTunes and Google Play! Or better yet use that nifty applause feature in the Anchor app! You can find more about Boardgames FM, and Theology of Games at Theologyofgames.com! Today we kickstarted some conversation around Kickstarter. Here are today’s segments: Morning Initiative—Let’s talk Kickstarter Campaigns! • What educational games do you play • Edge of darkness and Atlantis rising • Kickstarter: Endeavor and Valeria Card Kingdoms: Shadowvale — if you like what you hear it would be awesome if you’d share this show with a friend, or subscribe, rate and review us in iTunes and Google Play! Or better yet use that nifty applause feature in the Anchor app! You can find more about Boardgames FM, and Theology of Games at Theologyofgames.com! Jeremiah is about to announce the winner of the contest being run on That’s How I Roll! Here are today’s segments: Morning Initiative—Jan. 30, 2018 • Last Call for a Chance to Win!! Spoils of War game and Broken Token insert! — if you like what you hear it would be awesome if you’d share this show with a friend, or subscribe, rate and review us in iTunes and Google Play! Or better yet use that nifty applause feature in the Anchor app! You can find more about Boardgames FM, and Theology of Games at Theologyofgames.com! Today we start off with a segment from AJ about negativity in the boardgame community, and end with some dystopia talk and random news! Here are today’s segments: Family friendly games • Dystopian games and random news. — if you like what you hear it would be awesome if you’d share this show with a friend, or subscribe, rate and review us in iTunes and Google Play! Or better yet use that nifty applause feature in the Anchor app! You can find more about Boardgames FM, and Theology of Games at Theologyofgames.com! Today we continue the dystopian conversation! Here is today’s segment: Dystopian Board Games: Imperial 2030. — if you like what you hear it would be awesome if you’d share this show with a friend, or subscribe, rate and review us in iTunes and Google Play! Or better yet use that nifty applause feature in the Anchor app! You can find more about Boardgames FM, and Theology of Games at Theologyofgames.com! Today Jeremiah brings the topic of dystopian themed gaming to the table. So what are you favorite games with a dystopian theme?? Here are today’s segments: Saturday initiative—Jan. 27, 2018 • Dystopian Games! What’s your favorite?? • My favorite is • Thanks for calling in Apollo Radio! — if you like what you hear it would be awesome if you’d share this show with a friend, or subscribe, rate and review us in iTunes and Google Play! Or better yet use that nifty applause feature in the Anchor app! You can find more about Boardgames FM, and Theology of Games at Theologyofgames.com! Today Jeremiah kicks off “What Will You Play Friday?” And gives some info on the Contest that’s happening over on That’s How I Roll! Morning Initiative—Friday Jan. 26, 2018 • What Will You Play Friday?? • More Free Stuff! Broken Token includes an insert in the Spoils of War Contest! If you want a chance to win go to www.theologyofgames.com/Roll and listen to the latest episode before Jan 31st, 2018 to find out how to enter! — if you like what you hear it would be awesome if you’d share this show with a friend, or subscribe, rate and review us in iTunes and Google Play! Or better yet use that nifty applause feature in the Anchor app! You can find more about Boardgames FM, and Theology of Games at Theologyofgames.com! Storytelling in Board Games—Firestone discusses games that have a storytelling element to them. — if you like what you hear it would be awesome if you’d share this show with a friend, or subscribe, rate and review us in iTunes and Google Play! Or better yet use that nifty applause feature in the Anchor app! You can find more about Boardgames FM, and Theology of Games at Theologyofgames.com! Today Firestone chats about a couple games he played at his local game Night this week. Here are today’s segments:The Oracle of Delphi • Fallout: The Board Game. — if you like what you hear it would be awesome if you’d share this show with a friend, or subscribe, rate and review us in iTunes and Google Play! Or better yet use that nifty applause feature in the Anchor app! You can find more about Boardgames FM, and Theology of Games at Theologyofgames.com! Morning Initiative- Jan. 23, 2018 Deluxified! • Is Deluxified worth it? Are you going Deluxe? • Win a Free Copy of Spoils of War! From #ArcaneWonders! • 2 Legit Questions!? — if you like what you hear it would be awesome if you’d share this show with a friend, or subscribe, rate and review us in iTunes and Google Play! Or better yet use that nifty applause feature in the Anchor app! You can find more about Boardgames FM, and Theology of Games at Theologyofgames.com! Today Firestone discusses the longevity and wealth of knowledge that is Boardgamegeek.com. Here is today’s segment: Happy 18th Birthday Boardgamegeek! — if you like what you hear it would be awesome if you’d share this show with a friend, or subscribe, rate and review us in iTunes and Google Play! Or better yet use that nifty applause feature in the Anchor app! You can find more about Boardgames FM, and Theology of Games at Theologyofgames.com! What will You Play.. BrAinź? Today We ask what will you play this weekend, Jeremiah shares about an opportunity to share gaming with the next generation of gamers and we have a discussion about Zombie Games as a genre. Here are today’s segments: Morning Initiative—Friday Jan. 19, 2018 • What Will You Play Friday? • Are Zombie Games Done?? — if you like what you hear it would be awesome if you’d share this show with a friend, or subscribe, rate and review us in iTunes and Google Play! Or better yet use that nifty applause feature in the Anchor app! You can find more about Boardgames FM, and Theology of Games at Theologyofgames.com! Today we replayed a few segments that didn’t make over to iTunes, but we thought they should do here we are. Today’s segments are: Replay Thursday! And a contest reminder! • Star Wars and Defenders of The Realm • Star Wars Imperial Assault! • Imperial assault problems. — if you like what you hear it would be awesome if you’d share this show with a friend, or subscribe, rate and review us in iTunes and Google Play! Or better yet use that nifty applause feature in the Anchor app! You can find more about Boardgames FM, and Theology of Games at Theologyofgames.com! And don’t forget to hit up Theologyofgames.com/Roll to find out how to enter for a chance to win Spoils of War from Arcane Wonders! Today Jeremiah and Firestone unveil their best of the best from 2017! Here are today’s segments: Firestone’s Top 10 Games of 2017: #1! • Jeremiah's Number 1 Game of 2017! — if you like what you hear it would be awesome if you’d share this show with a friend, or subscribe, rate and review us in iTunes and Google Play! Or better yet use that nifty applause feature in the Anchor app! You can find more about Boardgames FM, and Theology of Games at Theologyofgames.com! Today we bring you! Firestone’s Top 10 Games of 2017: #3-2 stay tuned as we finish off with our number 1 games of the year!! Coming up on Boardgames FM! — if you like what you hear it would be awesome if you’d share this show with a friend, or subscribe, rate and review us in iTunes and Google Play! Or better yet use that nifty applause feature in the Anchor app! You can find more about Boardgames FM, and Theology of Games at Theologyofgames.com! Jeremiah’s Top 10 of 2017 - #3 and #2!! Today that’s it, Jeremiah brings you numbers 2 and 3 of his top 10 list. More great contents including the culmination of the Boardgames FM Top Ten lists! — if you like what you hear it would be awesome if you’d share this show with a friend, or subscribe, rate and review us in iTunes and Google Play! Or better yet use that nifty applause feature in the Anchor app! You can find more about Boardgames FM, and Theology of Games at Theologyofgames.com! The Top 10 of 2017 Continues! Today Jeremiah and Firestone continue their top 10 lists. Here are today’s segments: Firestone’s Top 10 Games of 2017: #6-4 • Jeremiah’s Top 10 of 2017 #6-4 — if you like what you hear it would be awesome if you’d share this show with a friend, or subscribe, rate and review us in iTunes and Google Play! Or better yet use that nifty applause feature in the Anchor app! You can find more about Boardgames FM, and Theology of Games at Theologyofgames.com! Today we started our series of segments to announce the Boardgames FM Top 10 of 2017! Today we start with Firestone and Jeremiah giving their numbers 10-7 as we count down to the top Games of the year! Here are today’s segments: Firestone’s Top 10 Games of 2017: #10-7 • Jeremiah’s Top Ten of 2017 -#10-7! — if you like what you hear it would be awesome if you’d share this show with a friend, or subscribe, rate and review us in iTunes and Google Play! Or better yet use that nifty applause feature in the Anchor app! You can find more about Boardgames FM, and Theology of Games at Theologyofgames.com! Edge of Darkness - Red Scare! Today AJ chats about AEG’s announcement of Edge of Darkness and its ensuing Kickstarter campaign, and Jeremiah gives his 1st Impressions on Red Scare from Pandasaurus Games! Here are today’s segments: Edge Of Darkness by AEG • Red Scare! - 1st Impressions — if you like what you hear it would be awesome if you’d share this show with a friend, or subscribe, rate and review us in iTunes and Google Play! Or better yet use that nifty applause feature in the Anchor app! You can find more about Boardgames FM, and Theology of Games at Theologyofgames.com! Today Firestone runs down a few games he played at game night! Here are today’s segments: You Are the Chameleon! • 2nd Game of Gaia Project — if you like what you hear it would be awesome if you’d share this show with a friend, or subscribe, rate and review us in iTunes and Google Play! Or better yet use that nifty applause feature in the Anchor app! You can find more about Boardgames FM, and Theology of Games at Theologyofgames.com! Isle of Monsters - and More! Today Jeremiah gives us a First Impression of Isle of Monsters from Mayday Games, and asks the question: why do you listen to us?? Here are today’s segments:Morning intro! Lots coming at ya today! • 1st Impressions-Isle of Monsters from Mayday Games! • Why do you listen to us?? —— if you like what you hear it would be awesome if you’d share this show with a friend, or subscribe, rate and review us in iTunes and Google Play! Or better yet use that nifty applause feature in the Anchor app! You can find more about Boardgames FM, and Theology of Games at Theologyofgames.com! Today AJ and Firestone chat about Compounded from Dice Hate Me, and Gaia Project from Z-Man. — if you like what you hear it would be awesome if you’d share this show with a friend, or subscribe, rate and review us in iTunes and Google Play! Or better yet use that nifty applause feature in the Anchor app! You can find more about Boardgames FM, and Theology of Games at Theologyofgames.com! Monopoly Gamer Just Say No! Today AJ expounds on the non-virtues of Monopoly Gamer. Today’s segment: Monopoly Gamer......nope! — if you like what you hear it would be awesome if you’d share this show with a friend, or subscribe, rate and review us in iTunes and Google Play! Or better yet use that nifty applause feature in the Anchor app! You can find more about Boardgames FM, and Theology of Games at Theologyofgames.com! Today we talk more resolutions, top games of ‘17 and had a call in from the Be Afraid Show. Jeremiah also informs us about a contest running on his other podcast “That’s How I Roll”! Here are today’s segments: Happy New Year! Top Ten of 2017! • Be Afraid Calls in with a Resolution for 2017 • Enjoyable Immersion • Thanks for the Call in! Check out That’s How I Roll to enter the latest contest! — if you like what you hear it would be awesome if you’d share this show with a friend, or subscribe, rate and review us in iTunes and Google Play! Or better yet use that nifty applause feature in the Anchor app! 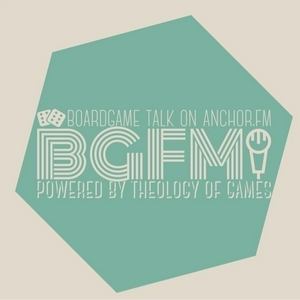 You can find more about Boardgames FM, and Theology of Games at Theologyofgames.com! Ring on the New Year! Today AJ and Jeremiah discuss gaming resolutions for 2018! Gaming resolutions and Queendomino • Happy New Year! And 2 Legit Questions! — if you like what you hear it would be awesome if you’d share this show with a friend, or subscribe, rate and review us in iTunes and Google Play! Or better yet use that nifty applause feature in the Anchor app! You can find more about Boardgames FM, and Theology of Games at Theologyofgames.com! Today Firestone brings thoughts about Gloomhaven hitting #1 on BGG, and Jeremiah shares his Christmas Haul! Join in the conversation and tell us what Santa brought you this year! Here are today’s segments: Gloomhaven is #1 on BGG • Christmas!!! What’d Ya Get!!?? — if you like what you hear it would be awesome if you’d share this show with a friend, or subscribe, rate and review us in iTunes and Google Play! Or better yet use that nifty applause feature in the Anchor app! You can find more about Boardgames FM, and Theology of Games at Theologyofgames.com! Today Firestone chats about Voyages of Marco Polo! Oracles, Royals & Steam Oh My! Lord of the Rings: LCG—Digital! Today AJ starts a discussion about the swirling rumors in the Star Wars universe! Today AJ and Jeremiah add two different games to the running total for this year’s Christmas Gift Guide! Here are today’s segments: A must-have game on the gift guide • Gift Guide - Captain Sonar! Today we chat about andwert sale at Amazon, and Jeremiah posted the second part of the: That’s How I Roll Christmas Gift Guide! Here are today’s segments: Terrific Amazon Sale! • That’s How I Roll Christmas Guide pt. 2! Today Firestone shares his first impressions of Whistle Stop from @Beziergames. We talk Christmas and Gloomhaven too! Here are today’s segments: Whistle Stop • Morning intro, Christmas come early • Gloomhaven Arrives! Werewords and Clank in Space! Today we recap the weekend and discuss a few new releases! Here are today’s segments: Thanksgiving recap • Thames and Kosmos releases • Kosmos Love: Imhotep! We had a caller ask about Games for family time, so Jeremiah took some time to answer his questions! Here are today’s segments: Good Morning! Let’s hear a call in! • Thoughts • Family Time? Go Cooperative! Black Friday, and a last Thankful Segment... Jeremiah shares one last Thankful thought this week... We have a call in to post tomorrow so stay tuned for that! We continue to give thanks this week, and AJ discusses some classic tabletop games... here are today’s segments: Morning intro, classic hobby games • Jeremiah Continues to be Thankful this week. Giving Thanks & Robbing Banks! We’re continuing to give thanks this week! Please call in (using the Anchor App) or email us Theologyofgames@gmail.com, or hit us up on the socials (@TheologyofGames) and let us know what you’re thankful for! Here are today’s segments: Morning intro, how to rob a bank • Busy. And Glad of it!! Let’s be thankful this week! The guys talk about being thankful, Games to play with family, and more, call in and join the conversation! Here are today’s segments: Giving Thanks... • What will you play this week • Thankfulness, and Betrayal Legacy! Just some quick updates over the weekend! We’ve got all kinds of stuff happening today! Here are today’s segments: Time Stories movie • Board games make us smarter. • Our first entries into the contest! • Preface for Half Life Movie • Half Life 3; the Movie • Unusual Suspects the Movie • Last Call for our Contest! Cover the Con, and a Contest! Today we discuss BGG Con, Pax Unplugged, Pillars of the Earth and launch a contest!! Here are today’s segments! Cover the Con Continues! Call in from Pax and BGG Con! • The Thing: Infection at Outpost 31 - First Impressions! • Cutthroat kingdoms and the thing • Pillars of the Earth Reprint • Contest Time! Win 2 3-Day Tickets to #PAXUnplugged!! We are all of us, Gamers. We’ve got more conversation about LARPing today! Here are today’s segments: Morning Jumpstart: More LARPing talk! • Virtual Reality Comes to life!! • Virtual Reality IRL! Jeremiah proposes a thought: LARPing!! You’re already doing it!! So much to cover today! Christmas, Kickstarters, 2 Legit Questions, and Call-ins!! Here are today’s segments: Morning intro, Christmas and family games • Christmas and Kids! • 2 Legit Questions: That’s How I Roll Episode 058! • What Will You Play Friday!? • What are we playing (Dice Forge and Terraforming mars) • Thanks for calling in Cameron! AJ tried to start a conversation about Christmas, but we ended up talking more about Kickstarter fulfillment. Here are today’s segments: Morning intro: recent Kickstarters and Christmas • Kickstarter: Me First! • Kickstarter: You’re Doing it Wrong! Who gets a Kickstarter 1st? Good Morning—Folklore: The Affliction • Kickstarter Fulfillment - Who gets it first?? • Backers first please. We discuss the ethics of Kickstarter fulfillment, and Firestone shares his thoughts on Folklore: The affliction. Go over to the Anchor App and call in to share your thoughts with us! If you have a good take we’ll feature you on the next show! See ya tomorrow! We talk accessories, as well as the games we have or have not played recently! The Morning Jumpstart: Essential Accessories!? • What I got the table this weekend and tonight • Mechs vs Minions, and Gloomhaven Inserts • Dice trays, dice towers, card holders, oh my! What Will You Play Friday? It’s time for What Will You Play Friday?? As well as some great conversations And a call in from the Be Afraid show! • Playing a euro! And talking meeple realty • Mixing in the Tabletop Fun • The game within a game • Friday Night Games! How do you set the mood? Card Crafting: Hot or Not? Co-ops: How Hard is Too Hard? Morning Jumpstart - Co-op Games, How Hard is too Hard? • More on co-op game difficulty • Challenging Co-ops • Leave Room for Creativity in Co-op • Let me Make a Meaningful Decision, Please!! Morning intro, Green Couch Games and the Weekend • Played this weekend: Mechs vs. Minions! The Morning Jumpstart - Spooky, Terrible, and Essentials! • Essential, Must Have Games! Spooky Games and Organ Hunt! Good Morning! Spooky Birthday Games! • The worst game mechanics • Organ harvest board game • Organ Attack • The Evening Wrap Up! Spooky Games and B-Day Wishes! Morning intro, what will you play this week? • Campy Creatures - And I’m Not 49... • More spooky games, and birthday wishes for Jeremiah! • Spooky Games - Oregon Trail?? What Will You Play Friday!? Sarah’s Singularity from Daily Magic Games! Digital Boardgames, Good Idea, or Unknowable Paradox? What do you think? Our Best Thrift Store Finds! Set collection. • I need a great theme. • New York Slice Quick Review • 2 Legit Questions - Favorite Co-op Game? Favorite thing about fall? Good morning! Oct. 6, 2017 • Designer of Red Scare, Ben Kanelos! • What Will You Play Friday? AND!! Recommend Some Fast Filler Games!! The Morning Rundown - Request an interview! Who do you want to hear from?? • Fresh from North Star Games • What is Your Barrier of Entry to a New Boardgame? The Morning Rundown ICYMI - Spoils of War, and Ben Kanelos • Through the Ages: Five Hours of Fun • Passport Partners with Thundergryph to Bring More Games to the U.S. • Pathfinder, Andor, Descent. OH MY! • Responding to AJ’s question about campaign Games. Do components make or break your gaming experience? Have you forged your dice yet? Boardgames FM Sept. 30, 2017 • What Will You Play Saturday? #boardgames #Tabletop • Dice Forge, too random? Or just right? The 7th Continent on Kickstarter! • The Great Debate! Trick taker? Or No? • Thunderstone Quest Begins Production!